It's not hard to understand why that particular doll was on clearance. But...I'm happy about Tink's wardrobe malfunction because it caused me to stop and notice some of the other Fairies sets. 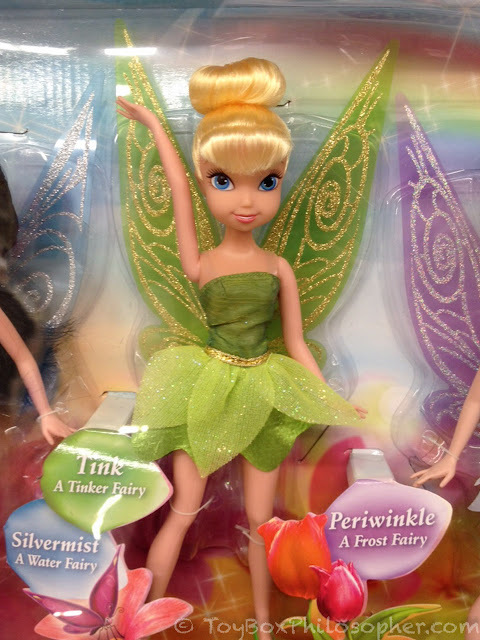 This is when I first saw the highly articulated Periwinkle and Tinker Bell dolls and started to think about writing a comparison review. 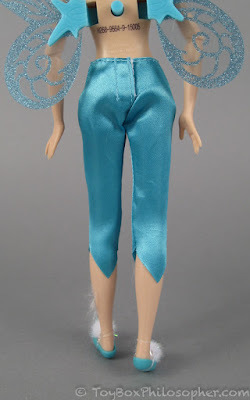 The Periwinkle doll in this set has molded pants and a fabric dress. 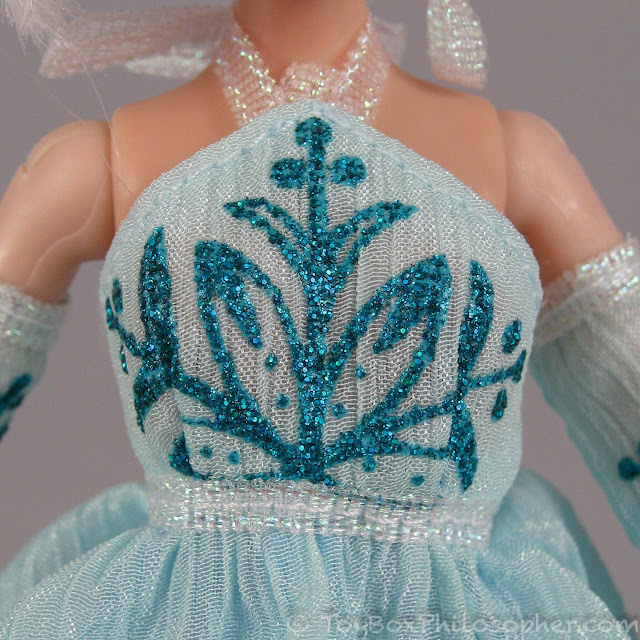 The other dolls have all-fabric outfits. 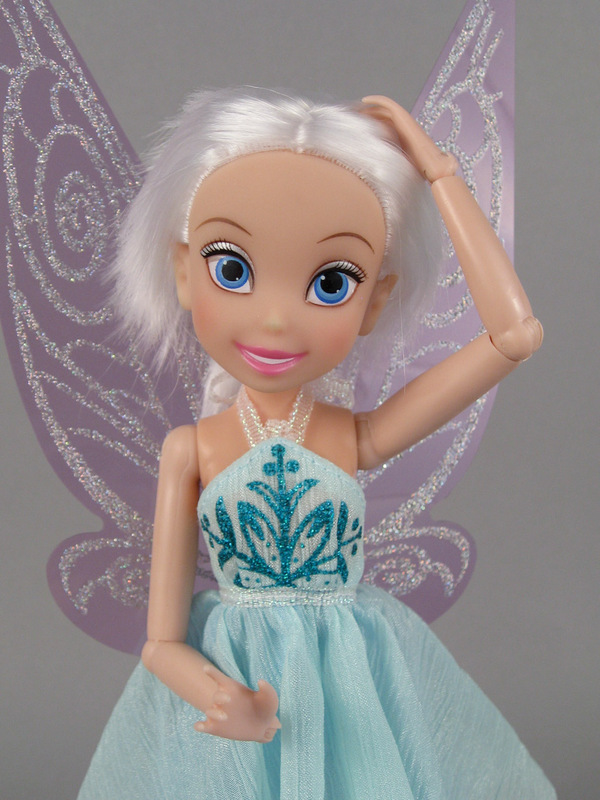 I find it interesting that these less expensive dolls have different (better?) faces than the highly-articulated Deluxe dolls. That's a bad picture...but a really cute face. 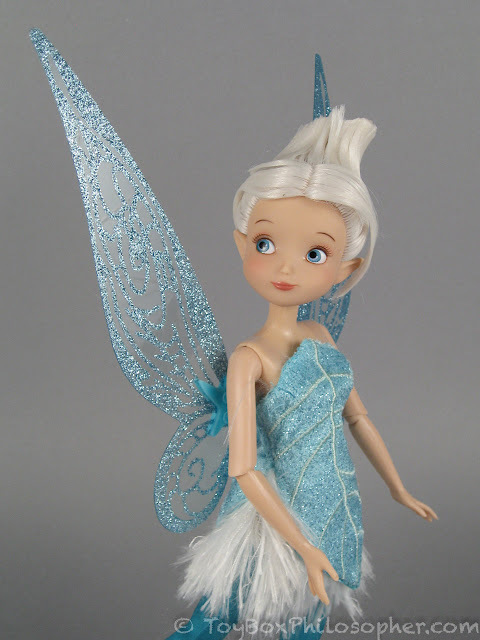 Not as sweet as the Disney Store's Tink, though. 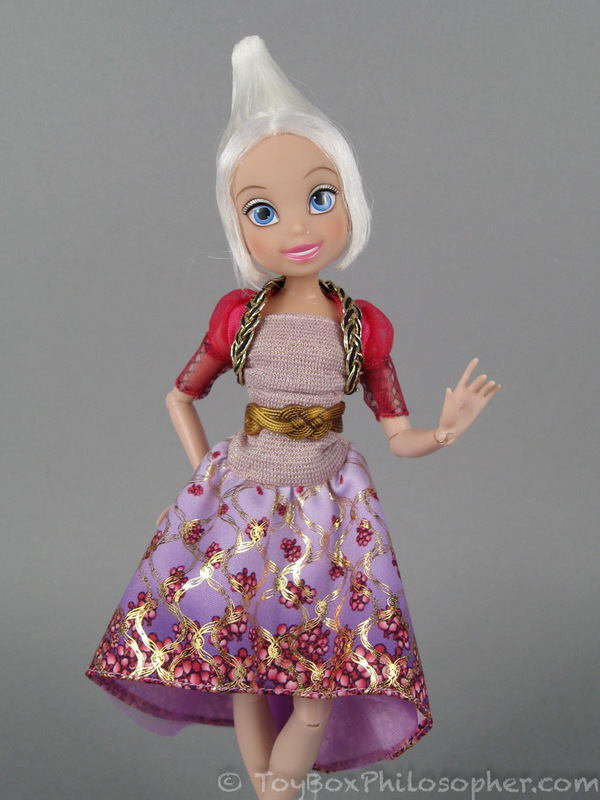 As Melissa noted, many of the Jakks Pacific dolls are marked up in stores (and especially online) right now. 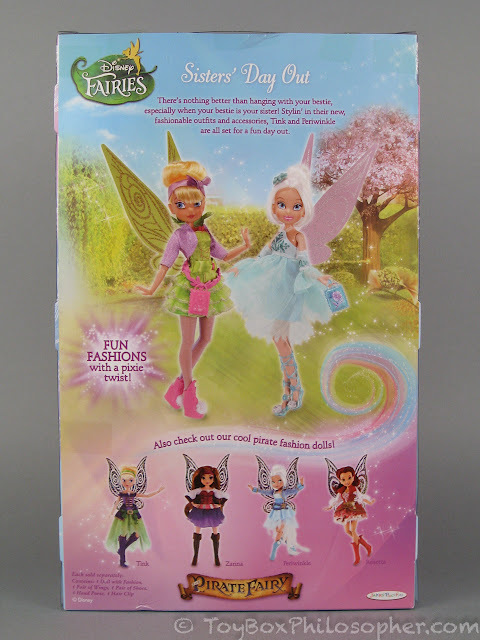 For example, the articulated Deluxe dolls have a MSRP of $14.99, but cost $16.99 at Toys R Us, $17.49 at Target, and up to $30-40 on Amazon (depending on the character). 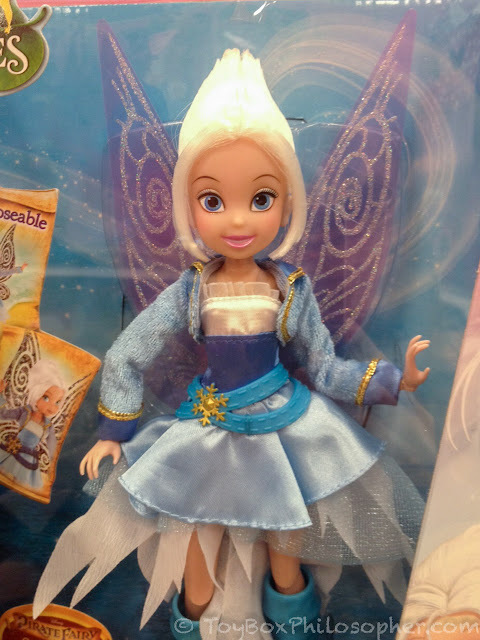 The Disney Store's Periwinkle doll. 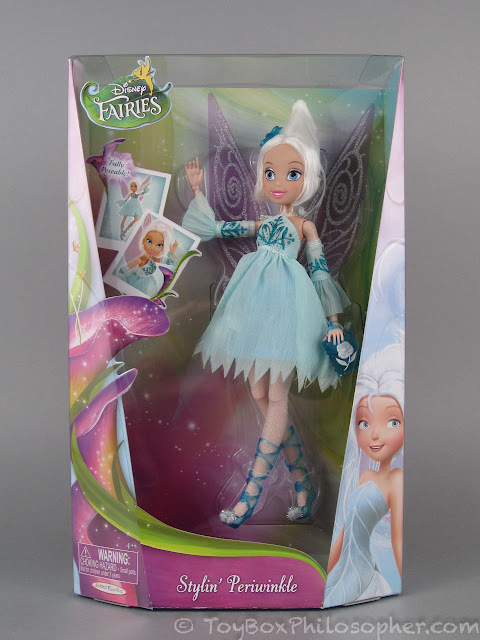 I agree with Melissa that de-boxing the Disney Store fairy was pretty simple. I did not uncover any pleasant or unpleasant surprises when I was getting Peri out of her box. 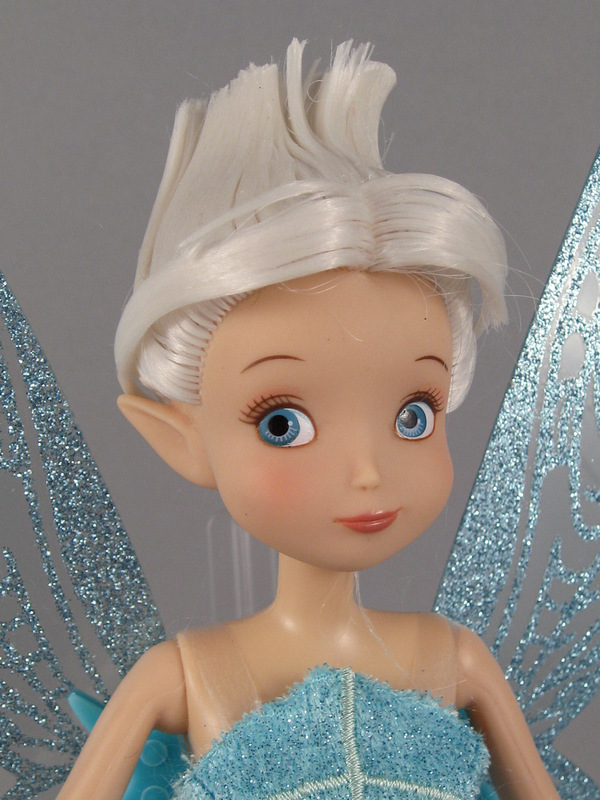 The Disney Store really did a fantastic job of capturing Periwinkle's personality in this face mold. 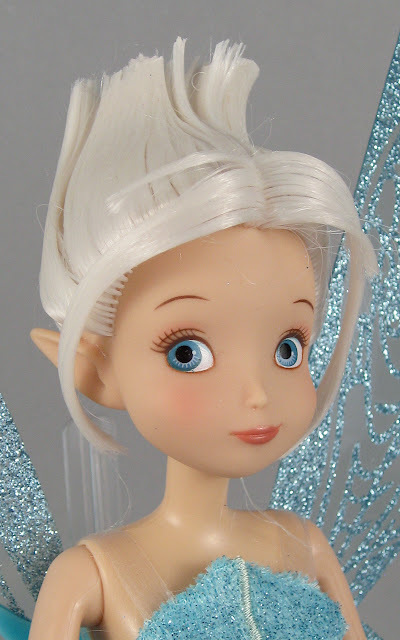 Everything--the shape of her eyes, the tilt in her thin eyebrows, her lopsided grin--is just right. 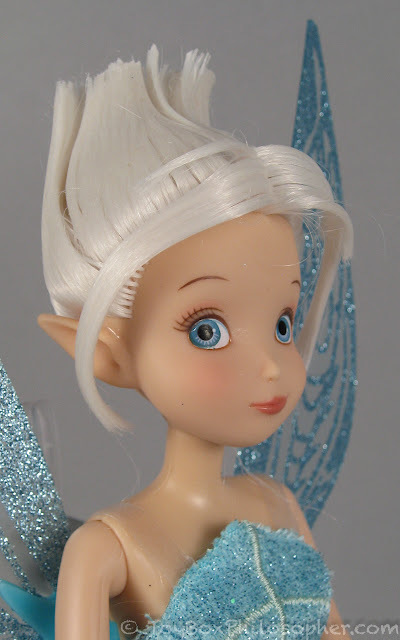 And, like Tink, Periwinkle has wonderful long pointed ears, which is perfect for a Vulcan a fairy! Live long and prosper! 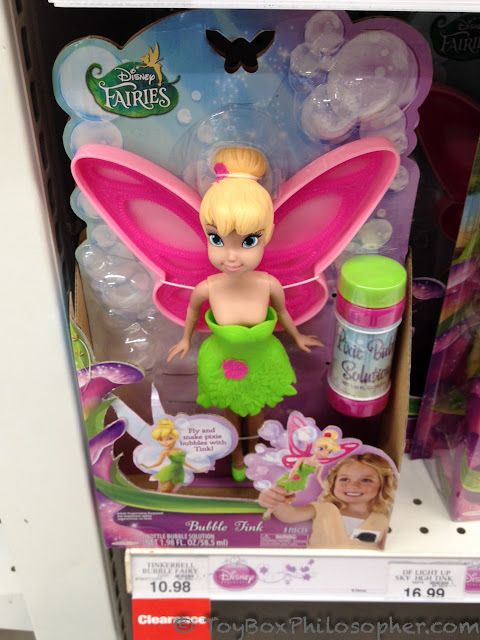 Faith, trust and pixie dust! The doll's hair relies on an overabundance of hair gel to keep all of the strands sticking up. 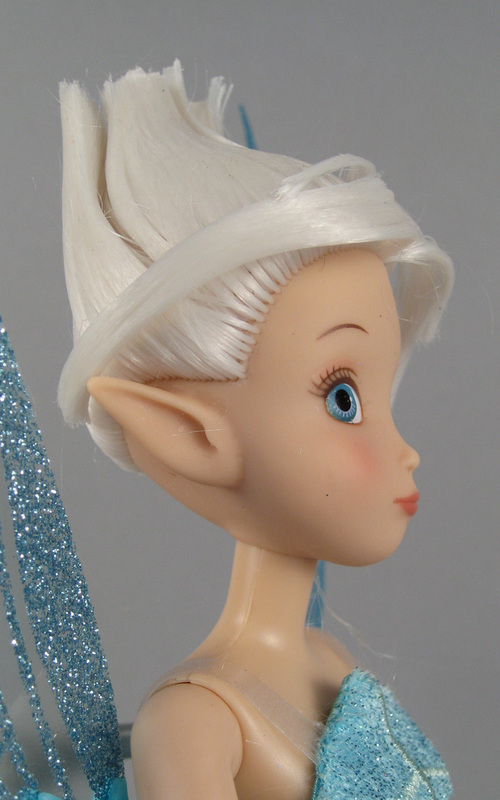 There's no wispy, pixie feel to the style, though. Reminds me of an onion. 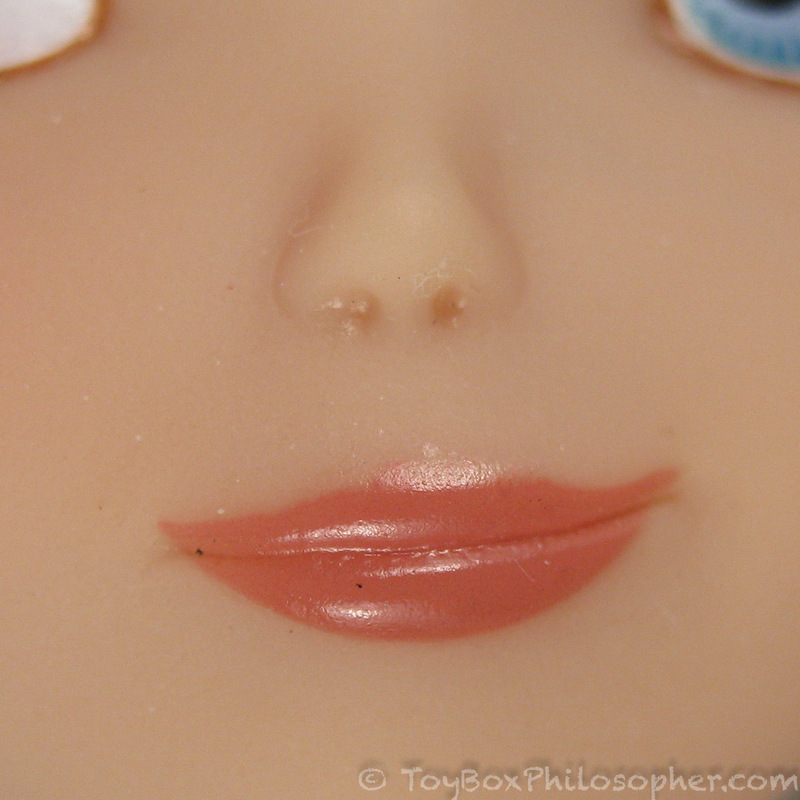 Peri has side-glancing blue eyes that are not at all wonky. Extremely close inspection reveals some small hairs trapped in the eye paint, but these are hard to see under normal magnification. 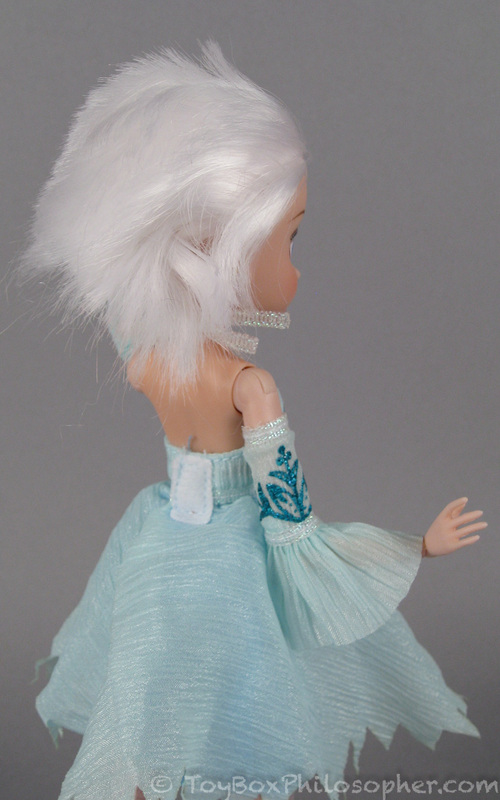 One odd feature of my doll is that she has several hair fibers trapped in her neck joint. I assumed these would be easy to pull out...but I have not been able to yank them free yet. I guess I'll snip them with scissors. 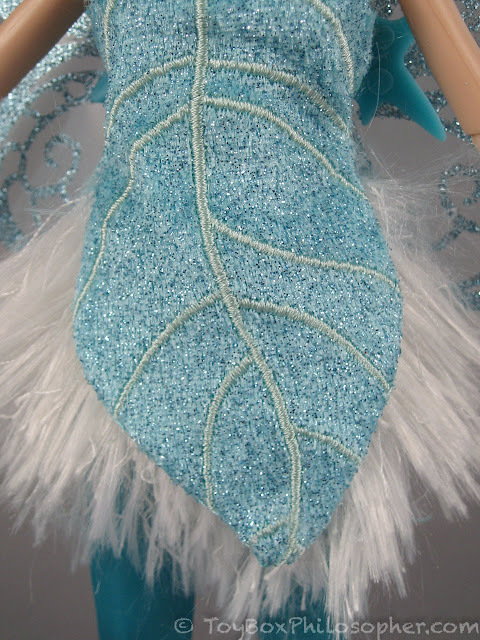 Notice that the leaf portion of the skirt is fully-lined. 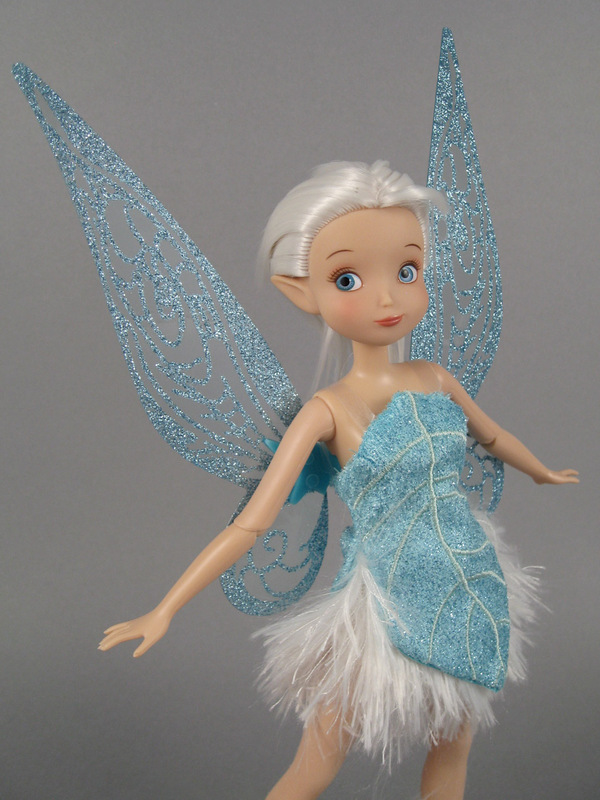 In the movie, the white part of the dress is made out of feathers. The doll skirt has the right look, but oh man--this thing sheds like crazy. It reminds me of a small white dog I know. Those fluffy white bits get everywhere and stick to everything. It might be worse than glitter. 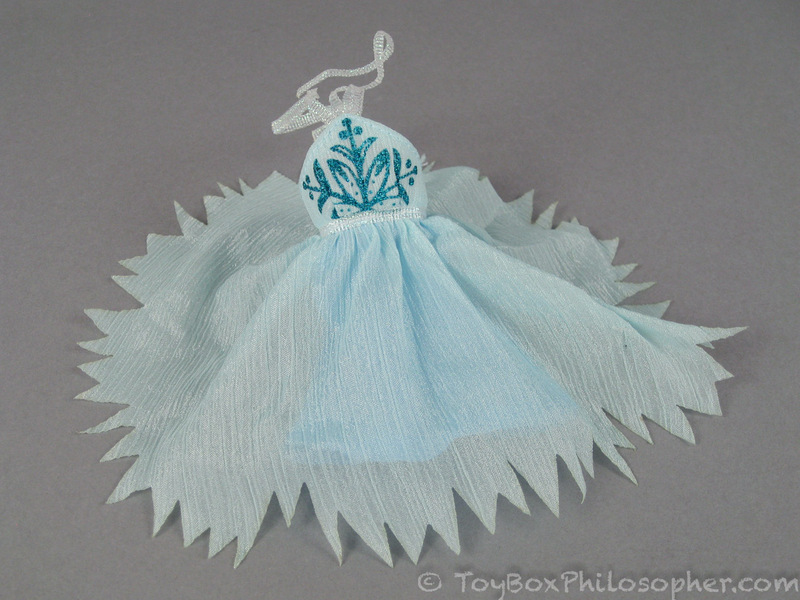 The whole dress is very soft and looks great...I just wish it wasn't coming to pieces before my very eyes. 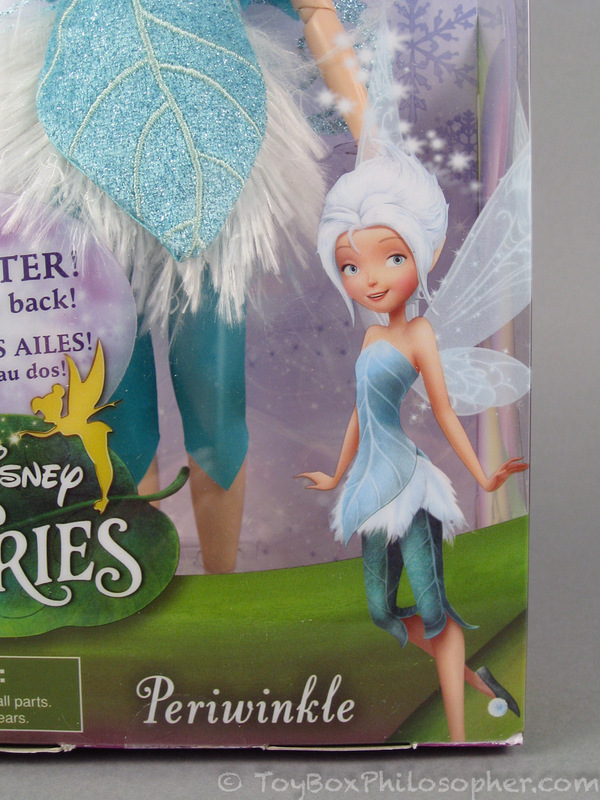 In the movie, these pants are made out of leaves, but that level of detail has been (understandably) left out. Periwinkle's body has a similar style to the click-kneed Disney Princesses from the Disney Store, but it's lacking wrist articulation and is smaller in scale. Speaking of the wings, I think the wing mechanism is great. It is a little awkward to use because you have to brace the doll with your hand and get a single finger in between the wings to press the button, but I love the simplicity of the design (no batteries!) and the added fun of the movement. 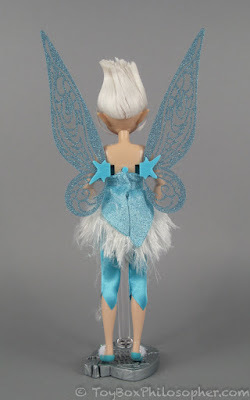 The animation of the wings in the Fairies movies is very well-done (with neat sound effects) and so I imagine that this is a feature many kids will want to replicate in their games. 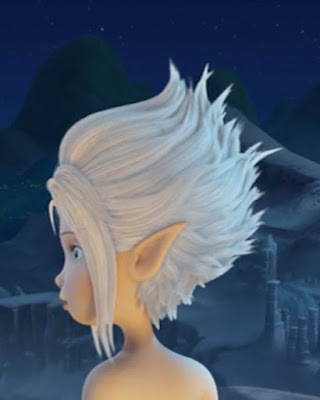 I made this clip at the very end of the review--after I had taken Periwinkle's hair down--so apologies for the disconnect. 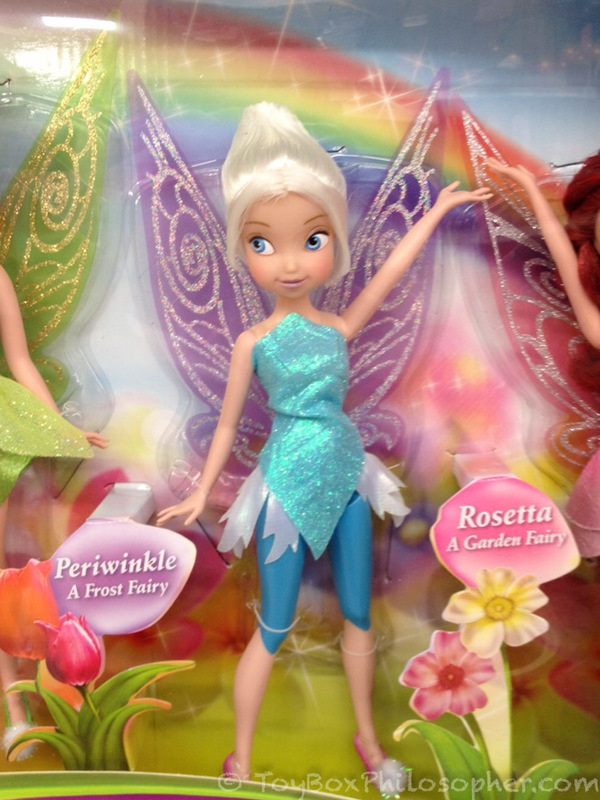 The rest of Periwinkle's articulation is the same as other Disney Store dolls. She can do great splits but can't quite bend her elbows to a 90 degree angle. 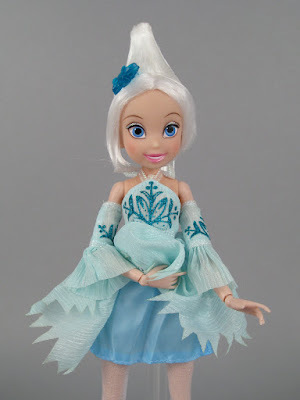 The flexibility of the click knees seems even more limited with this doll than it is with the larger Disney Princesses. I could only get the knees to click into one bent position. Disney Store's Periwinkle, Bratzillaz Meygana. 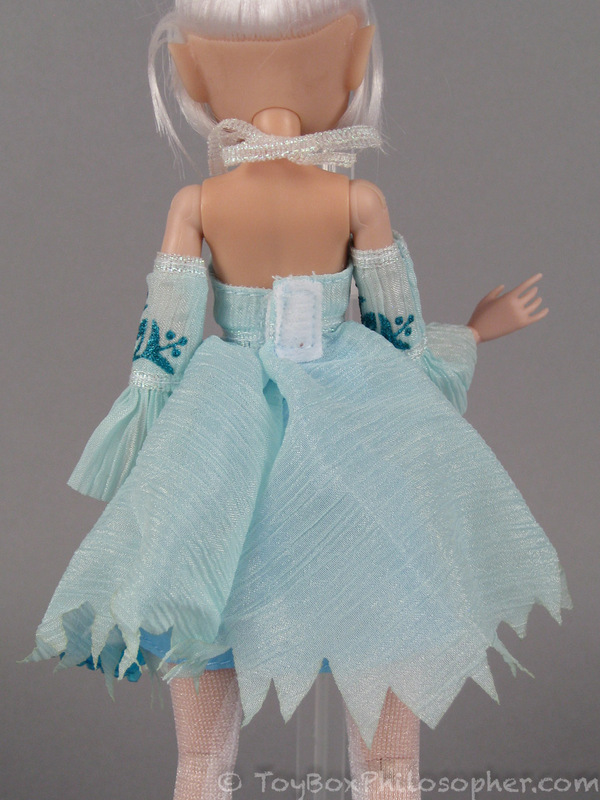 Meygana can wear Peri's dress, but it's a little big. 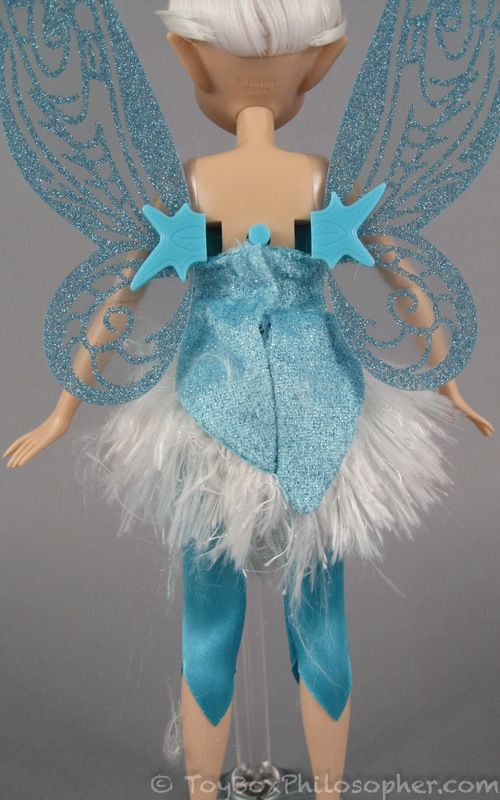 Periwinkle has trouble sharing any kind of clothes because of her permanently-attached wings. 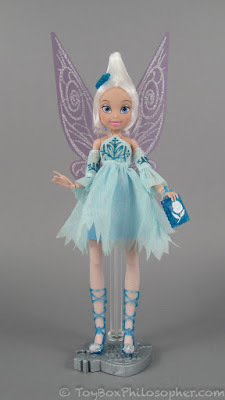 I suspect that even if I could get Meygana's dress on over Periwinkle's wings, the fit would be too tight. 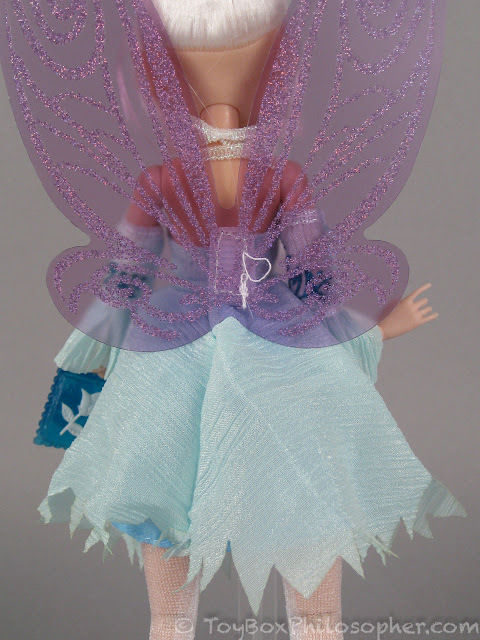 Disney Store Periwinkle, Moxie Girlz doll. Periwinkle wearing Moxie Girlz Kellan's clothes and vice versa. 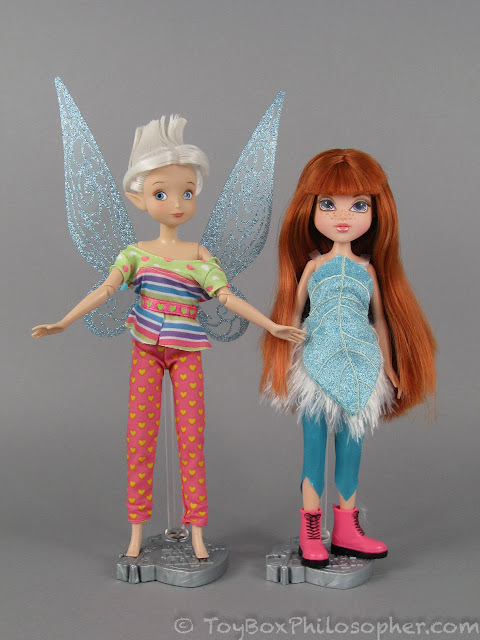 Project Mc2 Bryden and Disney Store Periwinkle. 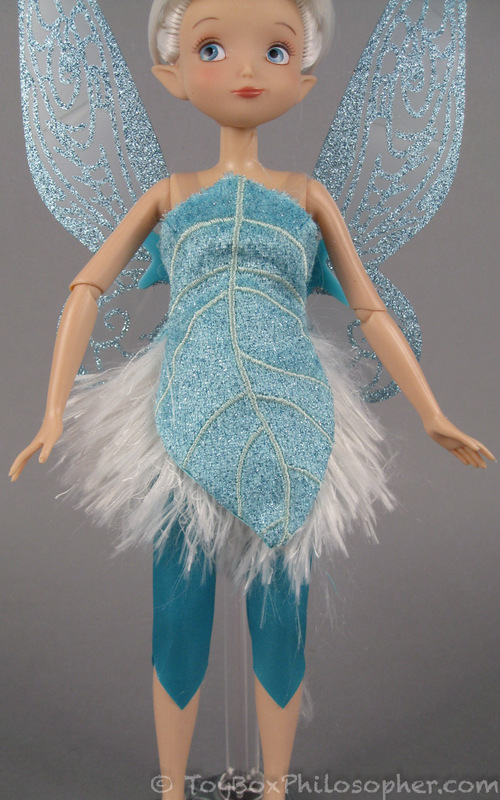 Not only does Bryden look great as a mermaid, but she makes an amazing fairy, too! This girl was meant to live in the fantasy realm. Despite Bryden's lack of articulation, I love this doll more and more every day. Disney Store Periwinkle in Project Mc2 McKeyla's overalls. 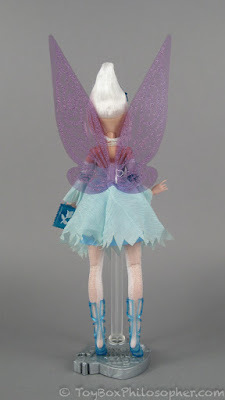 Disney Store Periwinkle, Barbie Stacie. 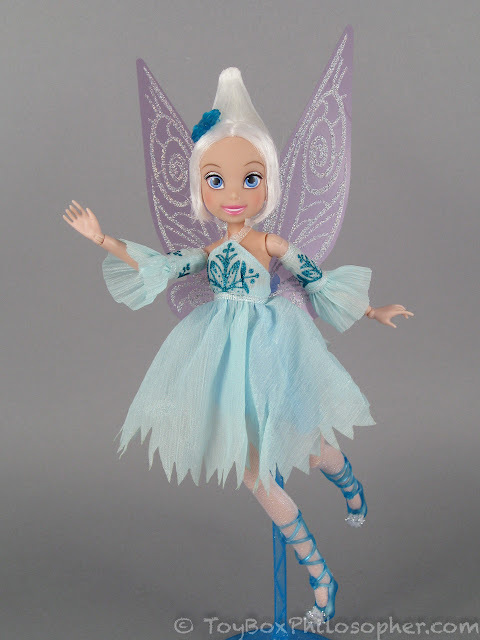 I didn't notice very many shoe-sharing opportunities, but Periwinkle's feet are about (if not exactly) the same as the larger Disney Store dolls' feet. 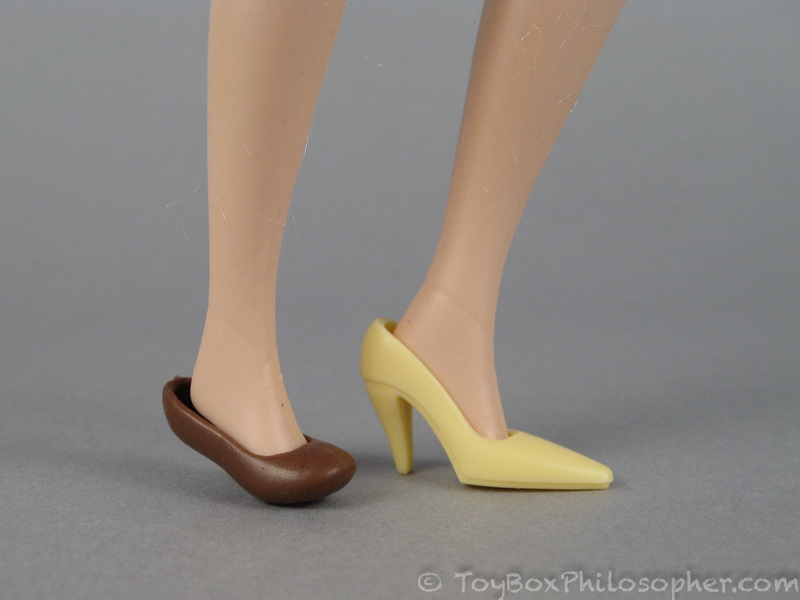 The shoes share molds with the Disney Princess doll shoes. 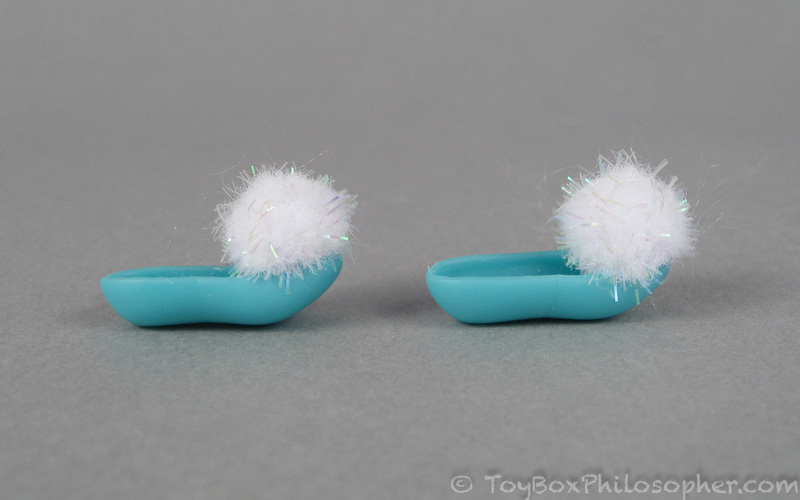 Merida's slipper (left) and Belle's shoe (right). 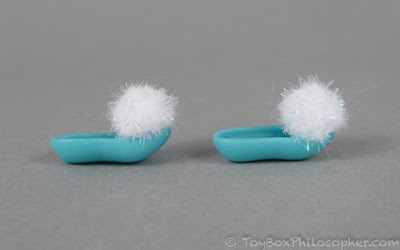 The mold of Merida's slippers is exactly the same as the mold of Periwinkle's shoes. 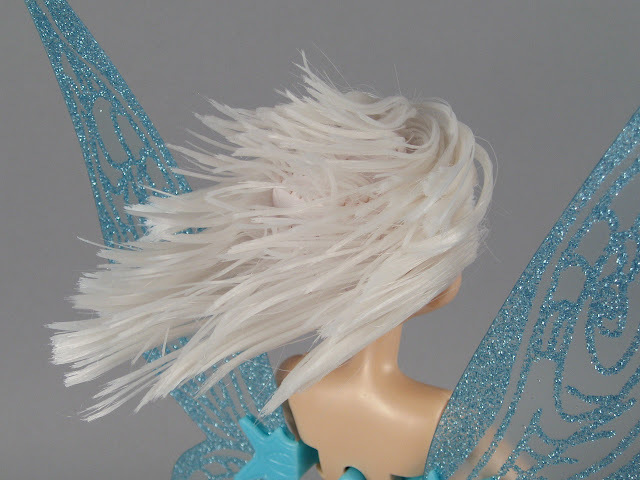 Stop frolicking through the cobwebs, Periwinkle. 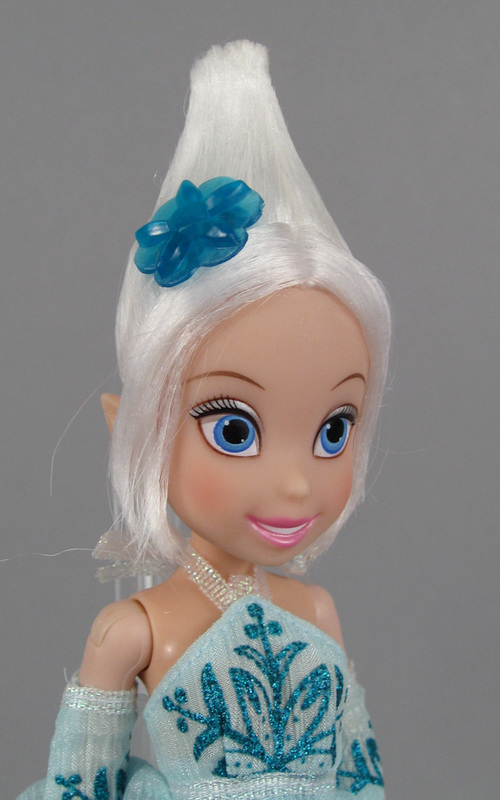 At this point, Periwinkle's hairstyle was relaxing a little at the top, which looked great--much less wedge-like. I was really hoping that this wasn't foreshadowing the hair's inability to stay in its original style, though. I still haven't seen The Pirate Fairy. It's next on my list! 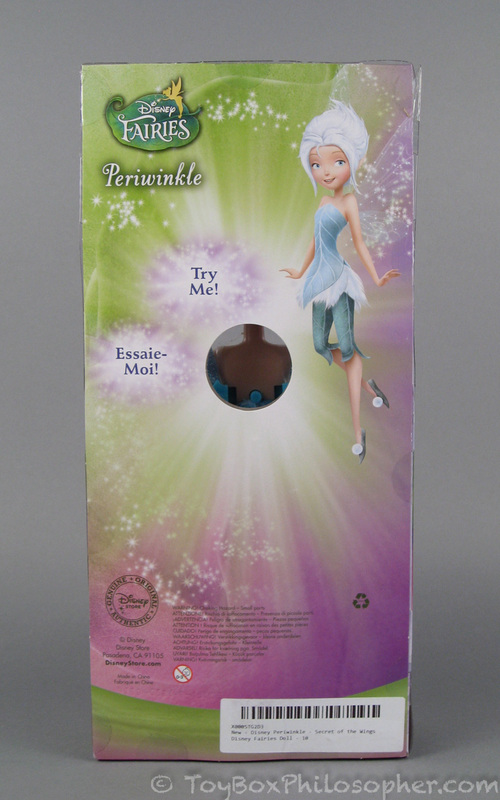 I did not find that de-boxing this Periwinkle was noticeably different from de-boxing the Disney Store doll. They both had their fair share of plastic tabs and plastic ties, but I was able to cut all of Peri's attachments and pull her free from the cardboard and the plastic casing while leaving the casing in place. Her purple wings are attached by velcro to the back of the dress. They are easy to get on and off, but do not have the same fun factor as the Disney Store doll's fluttering wings. This style has a bit more shape to it than the Disney Store doll's wedge-cut hair. She's a bit of a conehead. 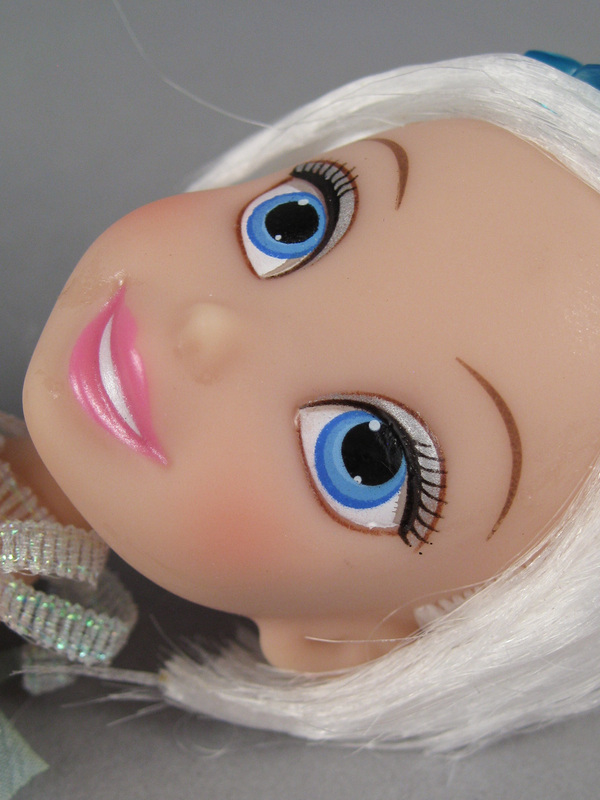 The other problem is that my doll's large eyes are severely wonky, and so she has an unintentionally goofy and disoriented look. She's wearing silver sparkly eyeshadow and bright pink lipstick. 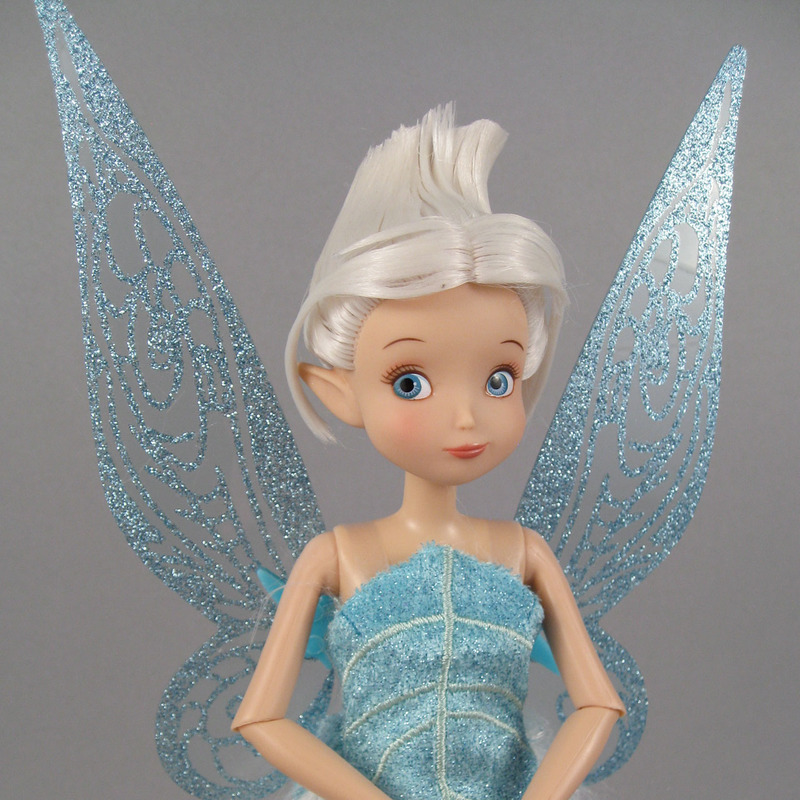 I prefer the more natural face of the Disney Store Periwinkle. 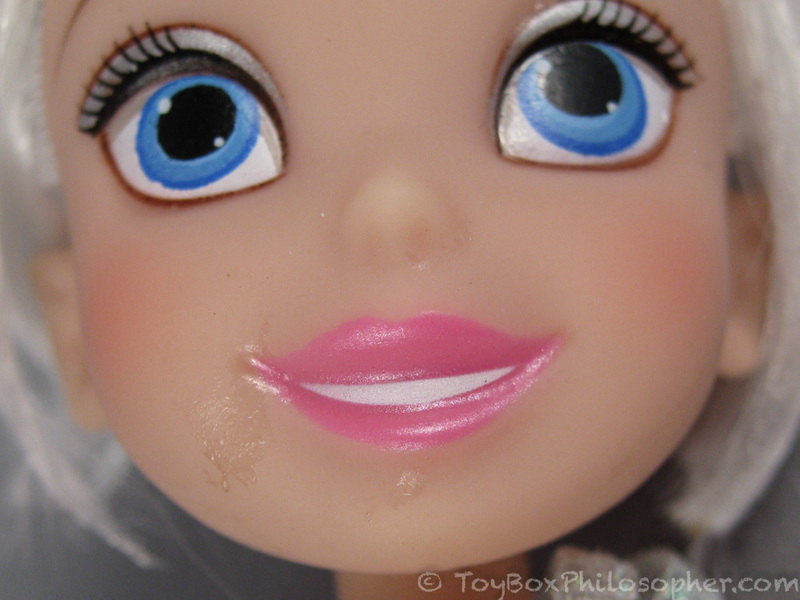 There's hair styling goo all over this doll's mouth, too, so it looks like she's drooling. It has a different flower on each side. 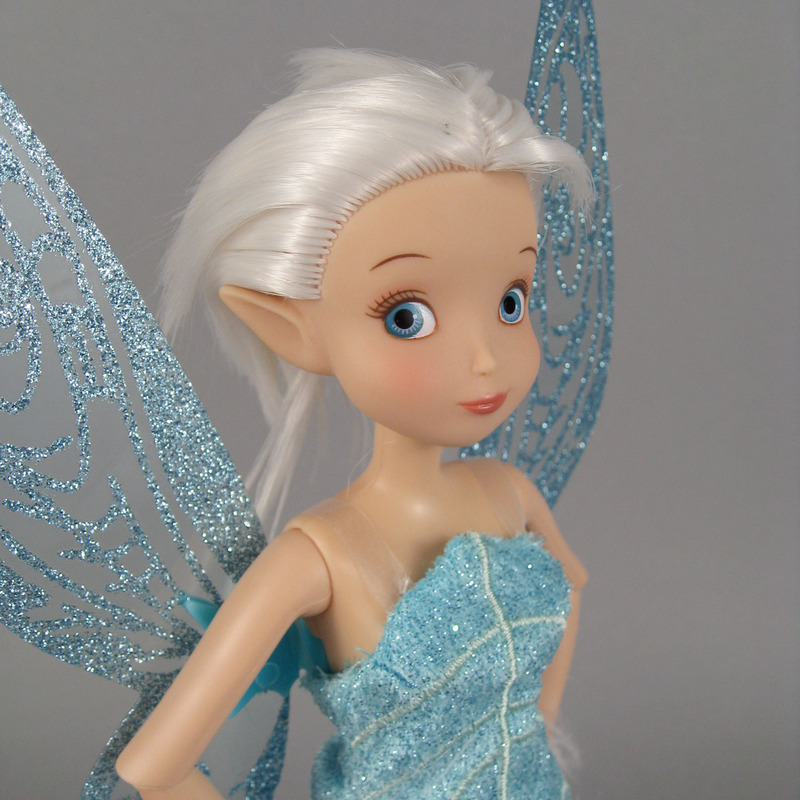 This Periwinkle has a hard plastic torso and articulated vinyl limbs. The color-matching between the plastic and the vinyl is not perfect. 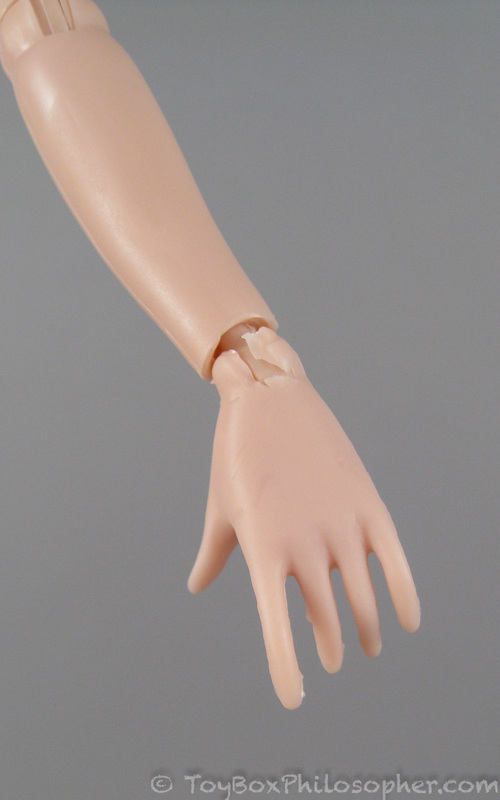 She has eleven points of articulation, including flexible wrists. 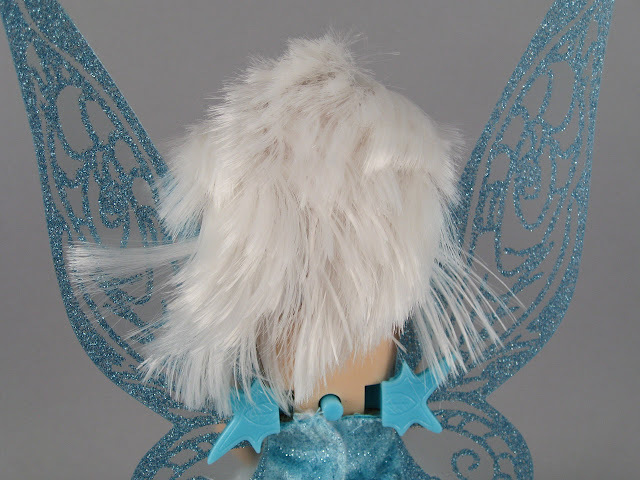 Periwinkle's head can look up, down, twist around and tip from side to side a little. Despite the unsightly wrists, all of Periwinkle's arm joints work well. 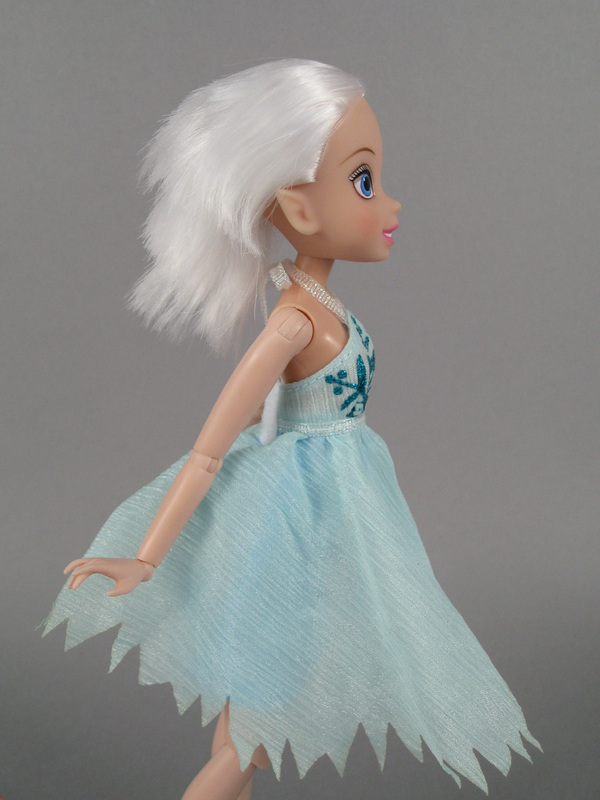 Her movement is a little sticky at the shoulders (where hard plastic meets softer vinyl), but it's not a huge problem. Does this count as a split? Bending the leg at the knee when the lower leg is rotated feels awkward, though. 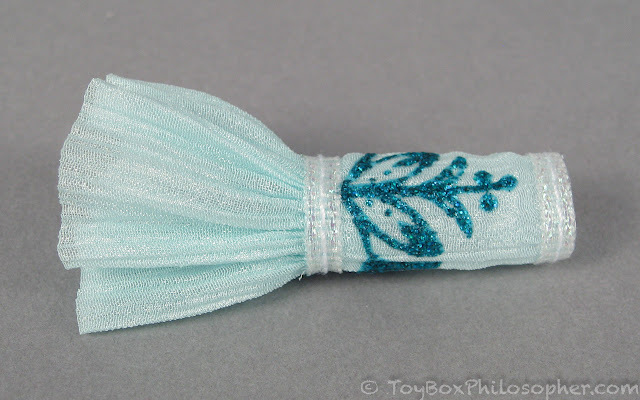 The vinyl at the top of the joint gets in the way of the lower leg's movement. It's not a great design. So, every time Periwinkle sits down she slices away at the top of her leg. Poor thing. 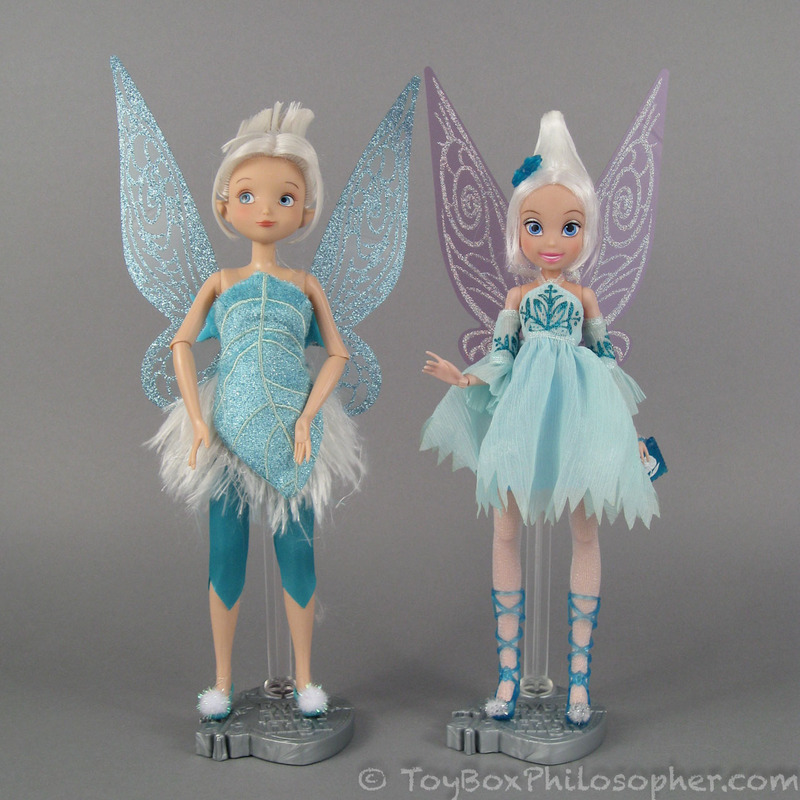 Disney Store Periwinkle (left) and Jakks Pacific Periwinkle (right). 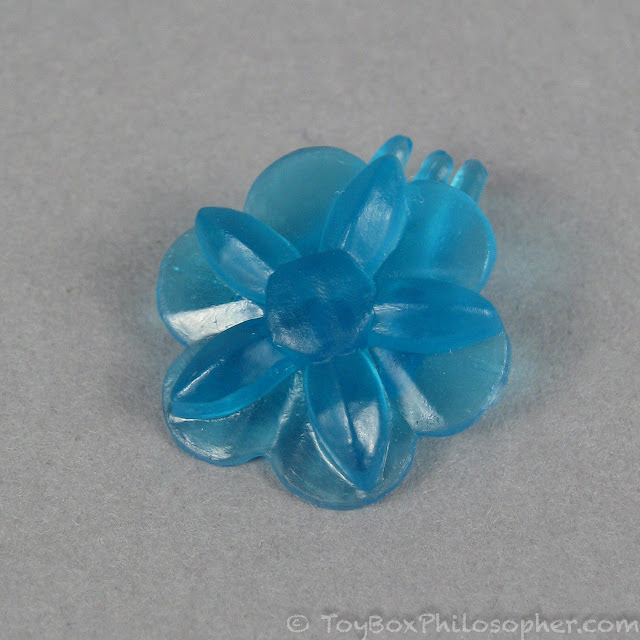 As Melissa mentioned, the Jakks Pacific Periwinkle is quite a bit smaller than her Disney Store counterpart. 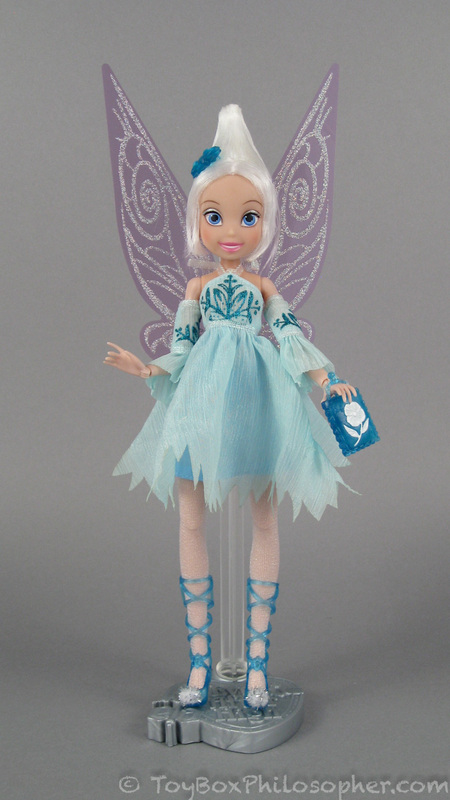 Ever After High Duchess Swan, Jakks Pacific Periwinkle. Jakks Periwinkle in Ever After High Holly O'Hair's dress. E.A.H. Duchess Swan in Jakks Pacific Periwinkle's dress. 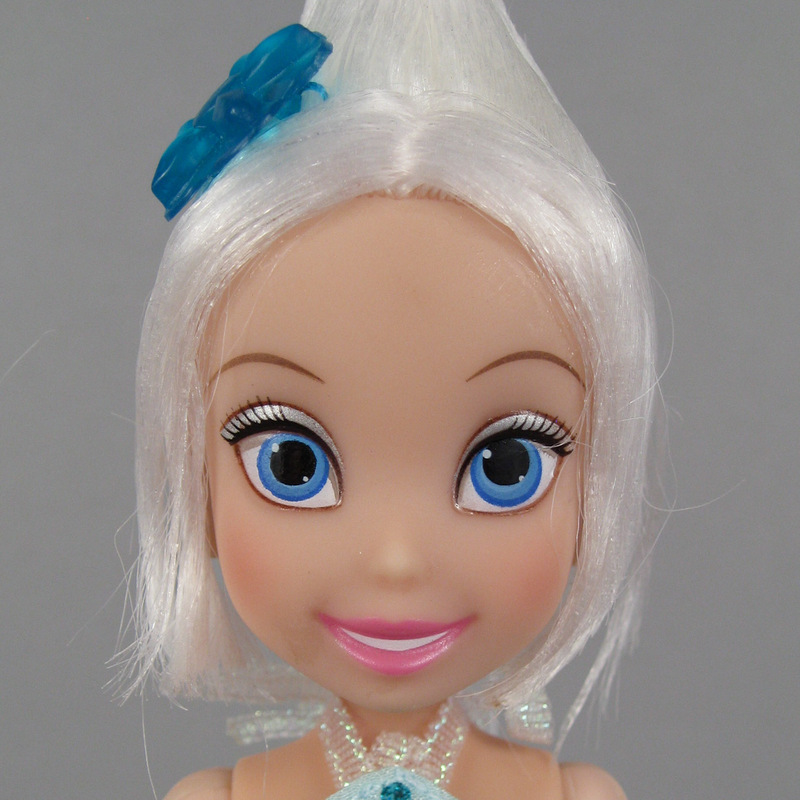 Bratzillaz Meygana, Jakks Pacific Periwinkle. Jakks Periwinkle in a Bratzillaz dress. This Periwinkle is more similar in overall size to the smaller dolls like Barbie's Stacie and Licca-chan, but the proportions of these dolls are different. Unlike the Disney Store Periwinkle, the Jakks doll cannot share shoes with the Disney Princesses as reliably. 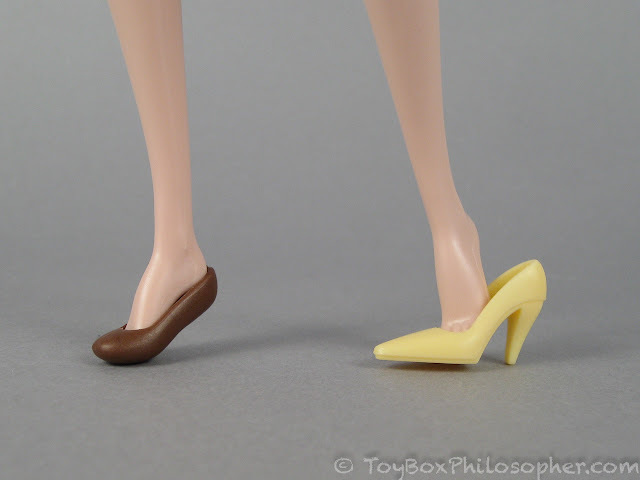 Merida's flexible brown slipper fits, but Belle's hard plastic pump is too small. 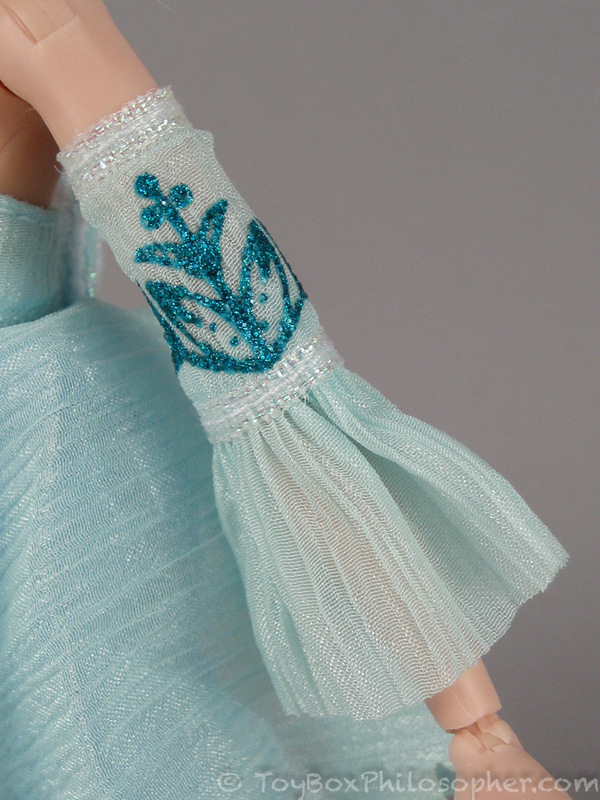 I figured that her hands must be removable, but so far I have been unable to pull them off...and I'm reluctant to tug on them any harder. The sleeves look wonderful when they're on, but I don't see how they'll be able to stand up to long-term re-dressing and play. Once I had taken most of the pictures I needed for this review, I decided to see what would happen if I boil-washed the extreme hairstyles on these two Periwinkle dolls. 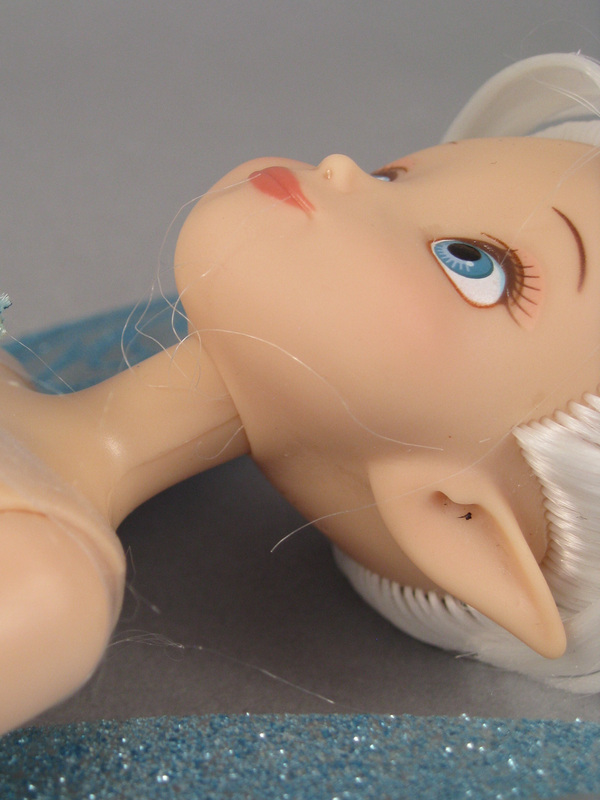 I used very hot water for this process, and let the dolls' heads soak for much longer than I normally do. I usually just dunk once or twice and then comb the hair out. 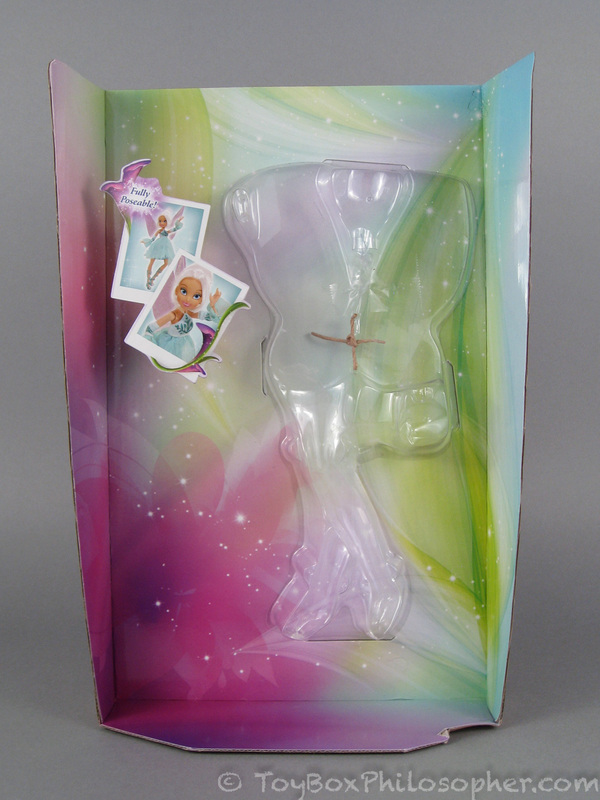 This time, I propped the dolls' heads into a cup of hot water and walked away for a few minutes. 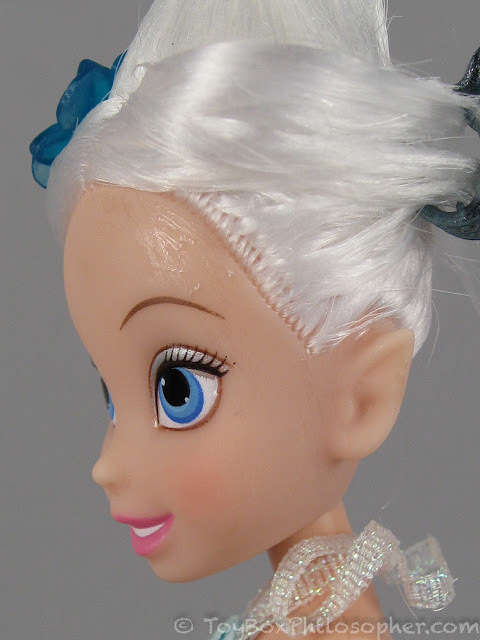 However, the rooting is good on the Jakks doll, and there are no huge portions of scalp showing. 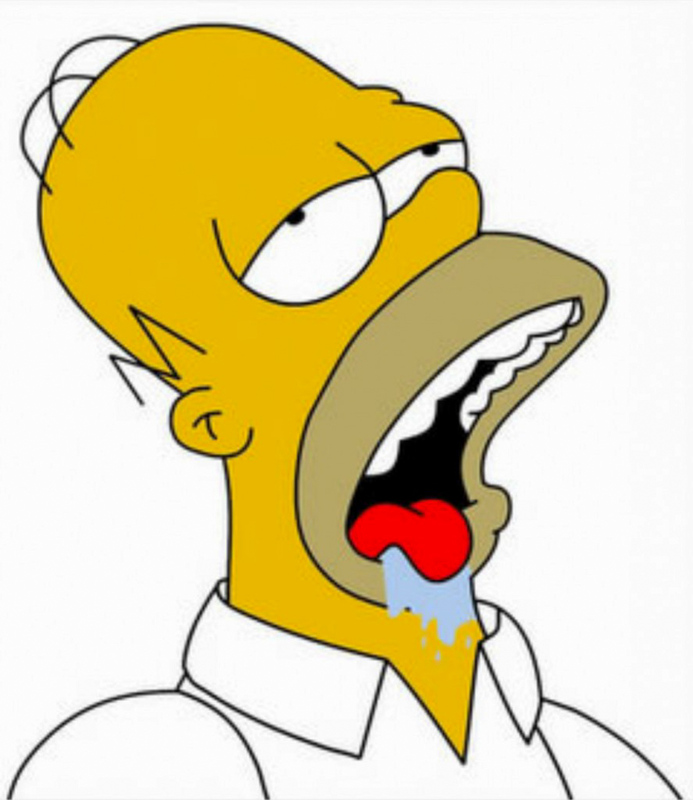 ...and then I repeated the boil wash process all over again and wrapped the hair in a paper towel as it dried. It softens her appearance a little. 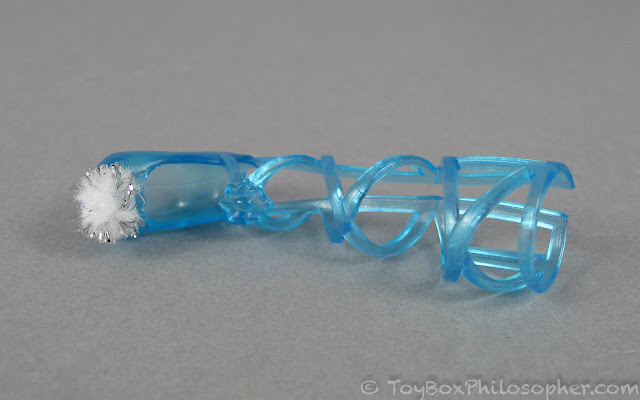 There were still a couple of strands that refused to behave. 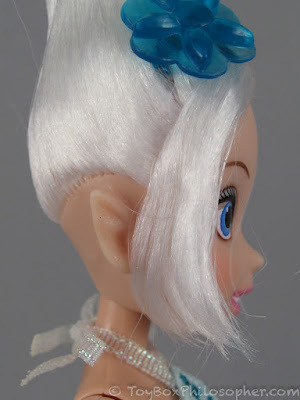 There are also more really short strands on the top of this doll's head than I saw on the Jakks doll. This makes it extra-tricky to keep the hair laying flat on top. I'm not exactly sure what to do next to tame the hair or keep it laying flat. I guess my recommendation would be (for both dolls) to leave the hair in its original set for as long as possible. On the other hand, don't panic if the hair eventually starts to lose its factory style and come down. 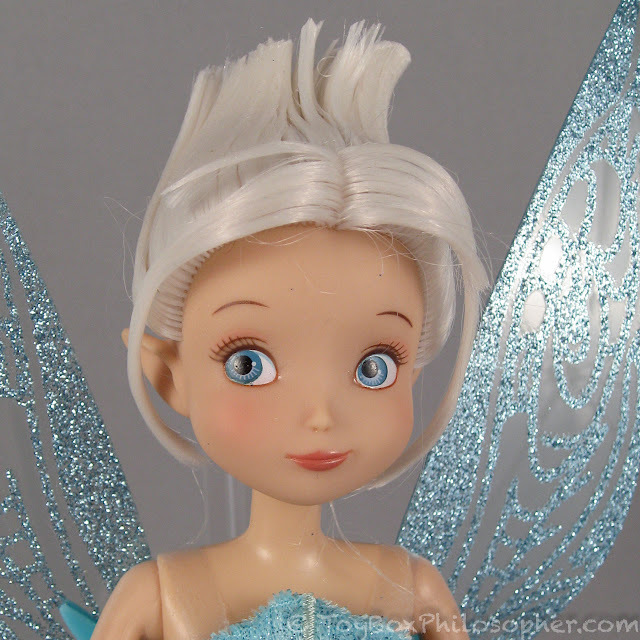 The doll will not be completely ruined if the styling product gets washed out. Bottom line? Let me try to summarize the main differences between these two fairies in a few broad categories. 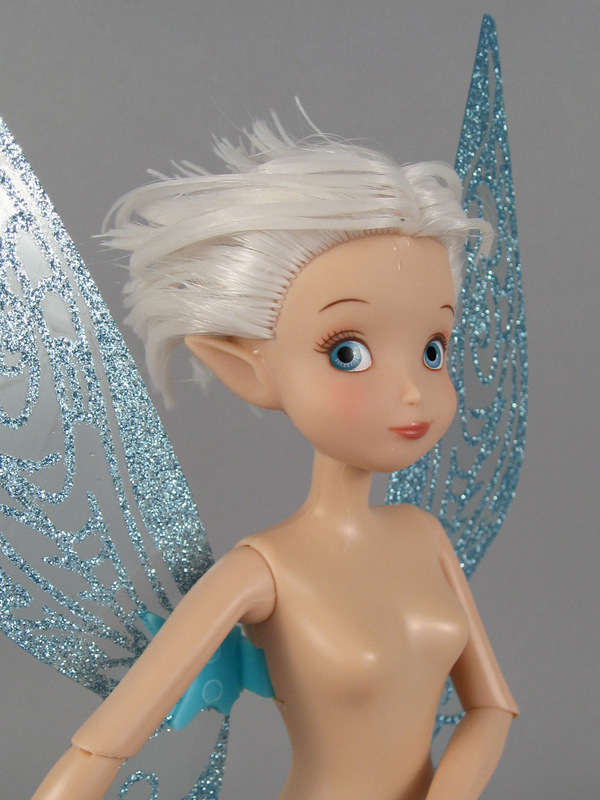 Faces: the Disney Store Periwinkle's face is sweet and appealing and looks just like the movie character. 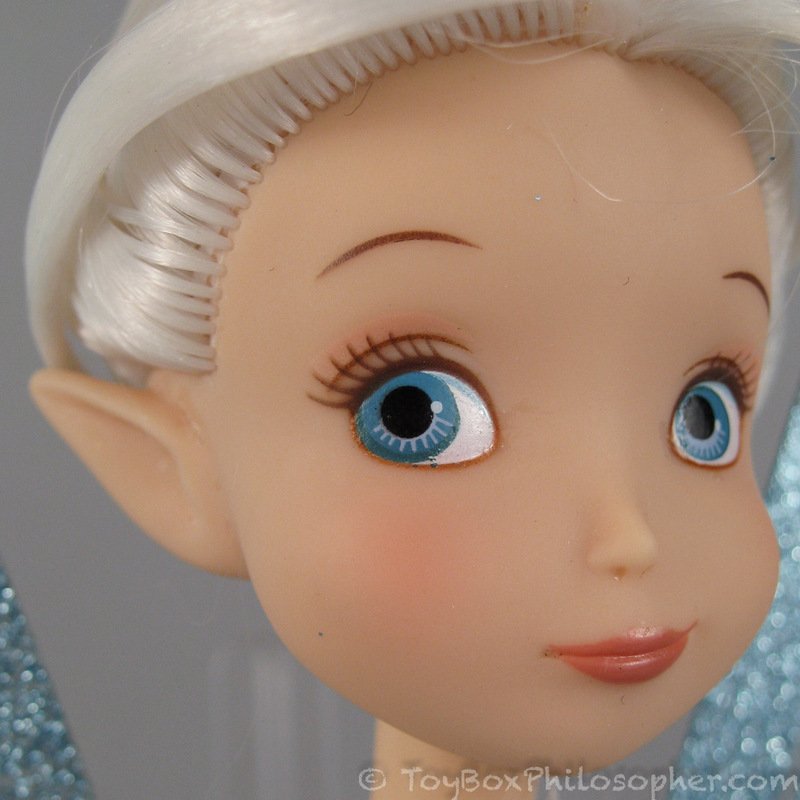 The Jakks Pacific Periwinkle's face is more generic, and my doll has wonky eyes. I overwhelmingly prefer the Disney Store face. 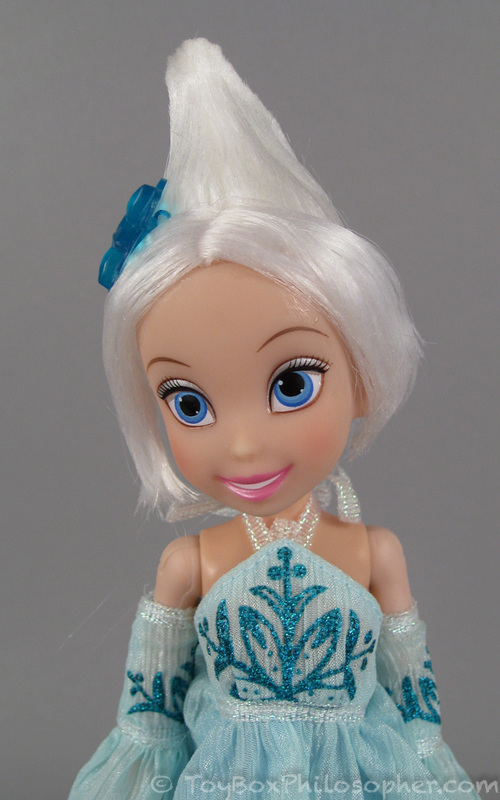 Hair: Both dolls have fun, gravity-defying, up-swept hairstyles that rely on copious amounts of gel to stay in place. 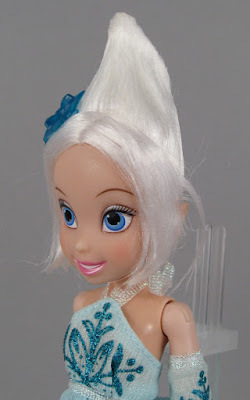 The Jakks Pacific doll's hair has a bit more styling gel and is quite pointy at the top, giving her a coneheaded look. 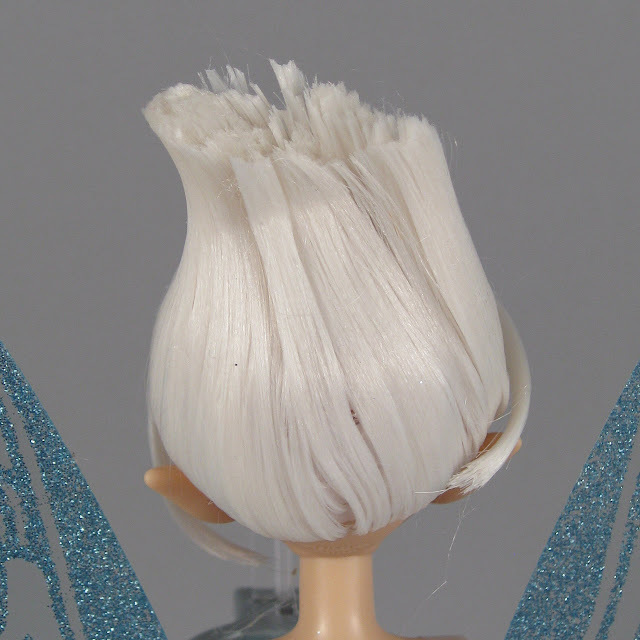 The Disney Store doll's hair has a slightly more relaxed shape, but the hair looks like it might come out of its style too easily. 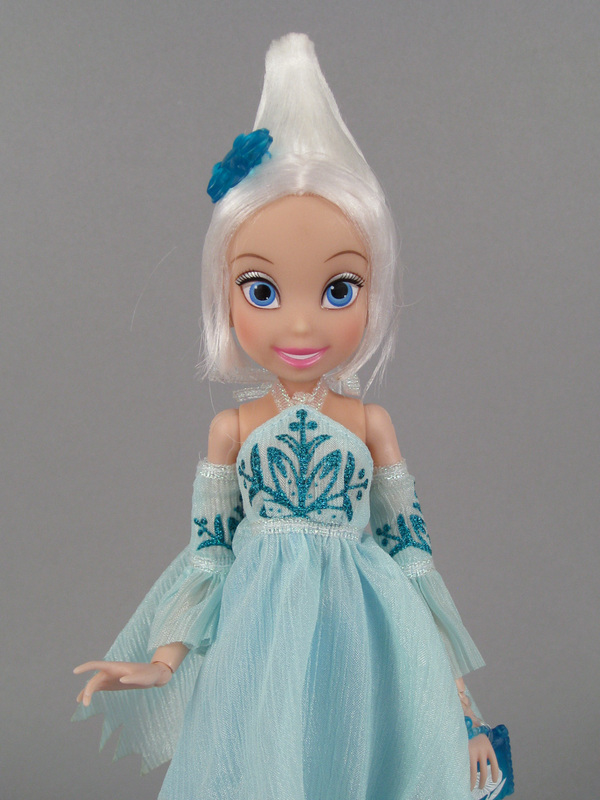 I prefer the more mellow white-blonde of the Disney Store Periwinkle's hair to the stark white of the Jakks doll. 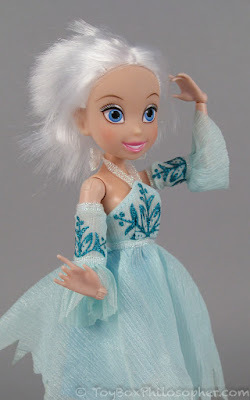 Both dolls can survive having their hair let down, although the Jakks doll's hair length is easier to work with and the rooting is slightly denser. The Disney Store doll's hair interferes with her wings when it is down. When both dolls have their original hairstyle, I like the Disney Store doll's hair better. 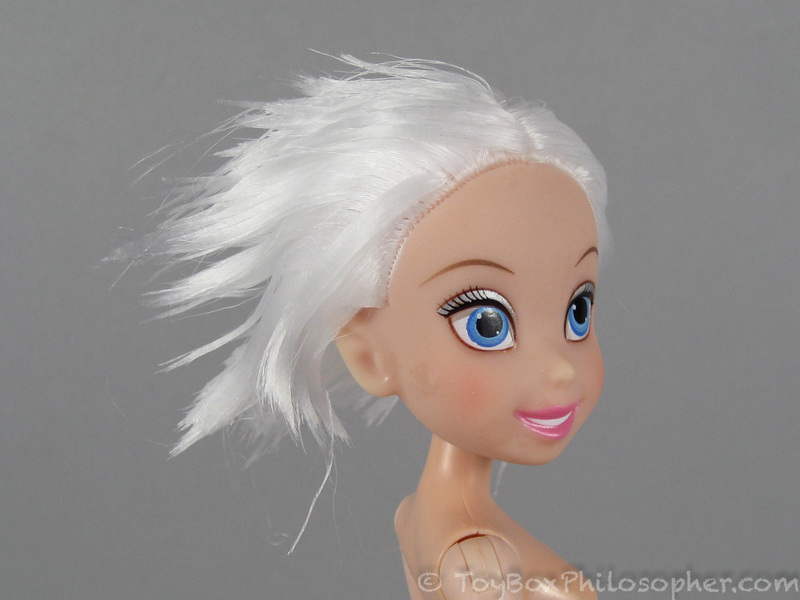 When the style is taken down, I slightly prefer the Jakks doll's hair. Clothing: Both outfits have some great features...and some pretty serious oversights. The Disney Store Periwinkle's dress is movie-accurate and has a neat leaf shape with beautiful vein embroidery. 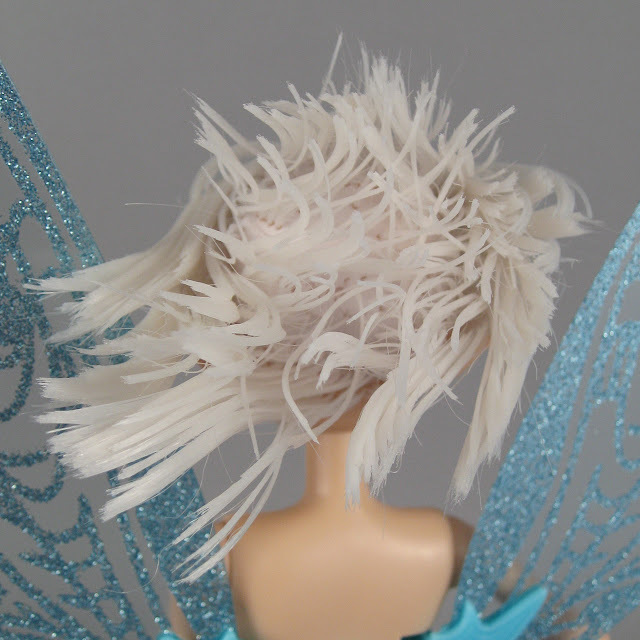 However, the feathery underskirt sheds like crazy and leaves bits of white fuzz stuck to everything--particularly the doll's rubber legs. 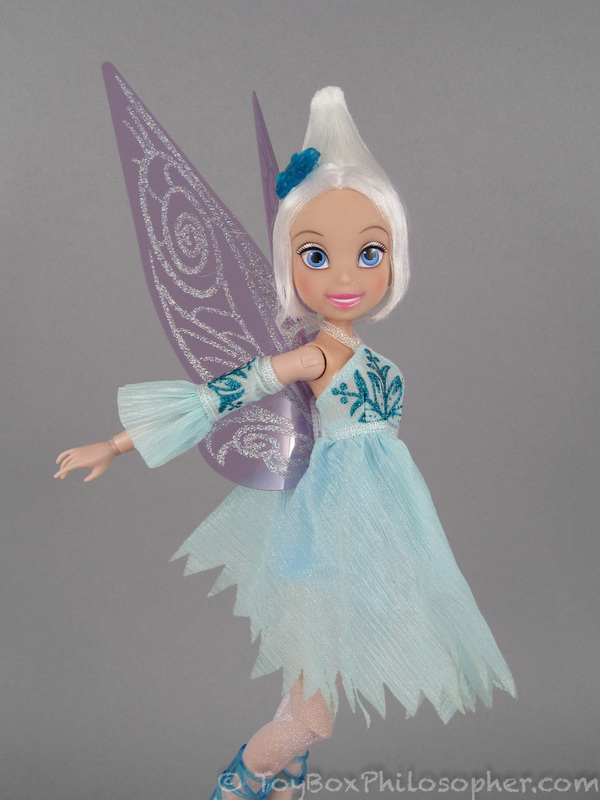 The Jakks Pacific Periwinkle's dress has a lovely, flowing shape and pretty glitter accents. However, the separate sleeves are difficult to fit over the doll's splayed fingers. 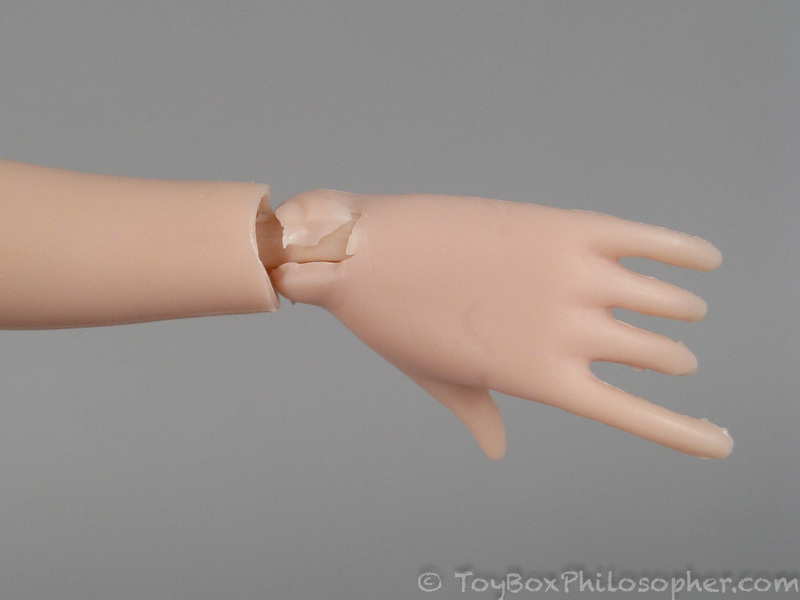 By the end of the review, it was almost impossible for me to get the sleeves back on. Overall, I prefer the Jakks Pacific dress (minus the sleeves) because it's pretty, it's easy to get on and off, and it doesn't shed! Articulation/body style: I am not a fan of rubbery legs and internal knee joints. 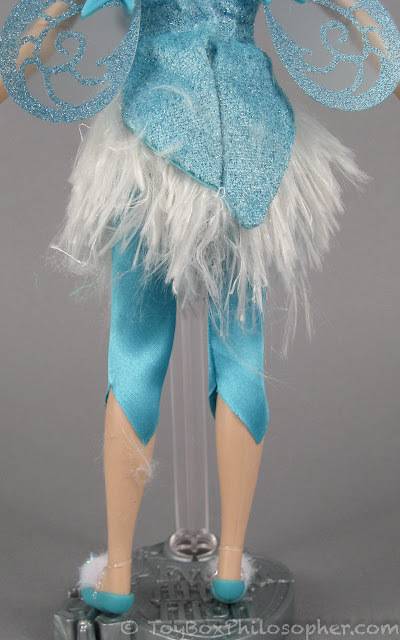 This type of joint is inflexible and way too fragile--at least the way the Disney Store is doing it. 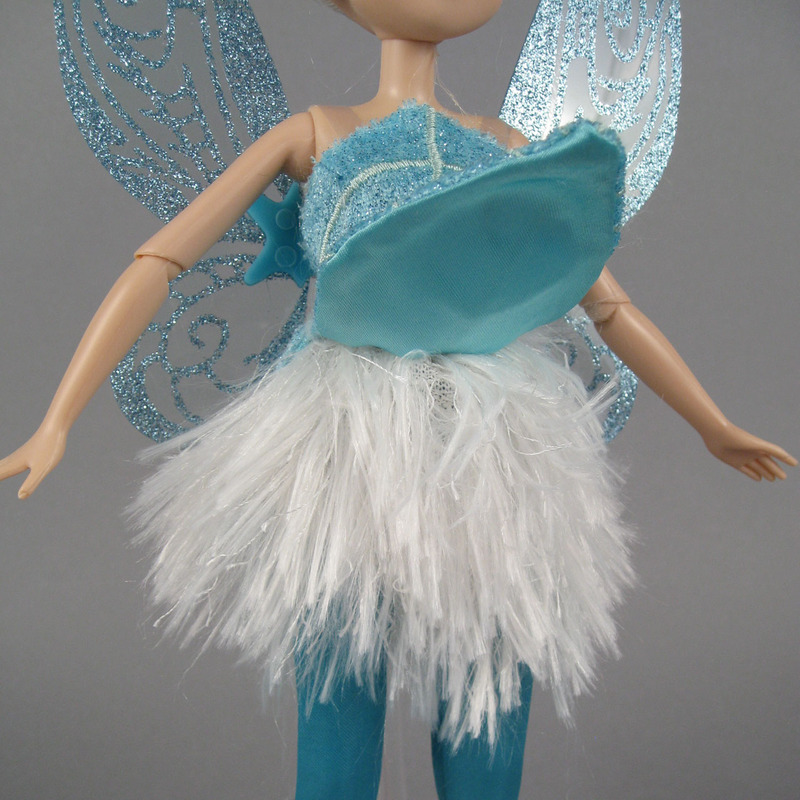 Rubbery legs also make dolls hard to dress and tricky to keep dust-free (or fuzz-free). 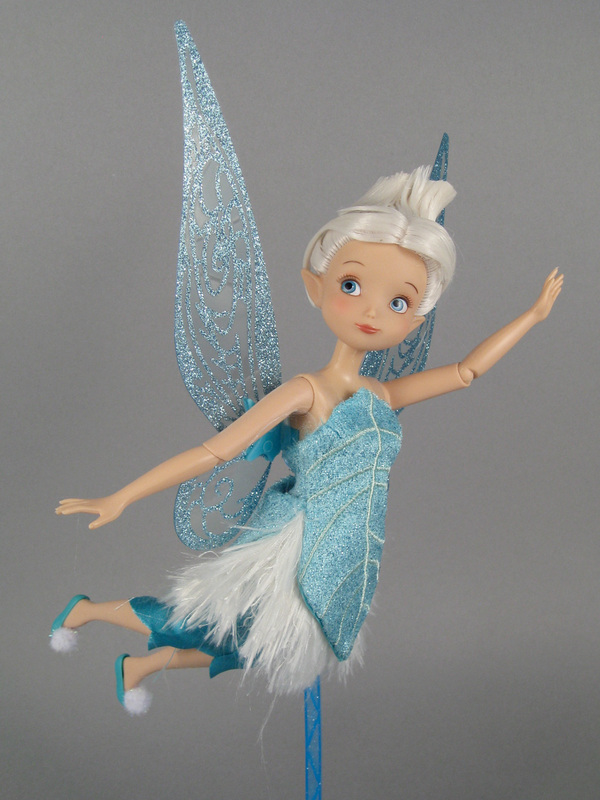 In addition, the Disney Store Periwinkle has limited head movement and no wrist articulation. The Jakks doll has great head movement and eleven points of rotating hinge articulation. 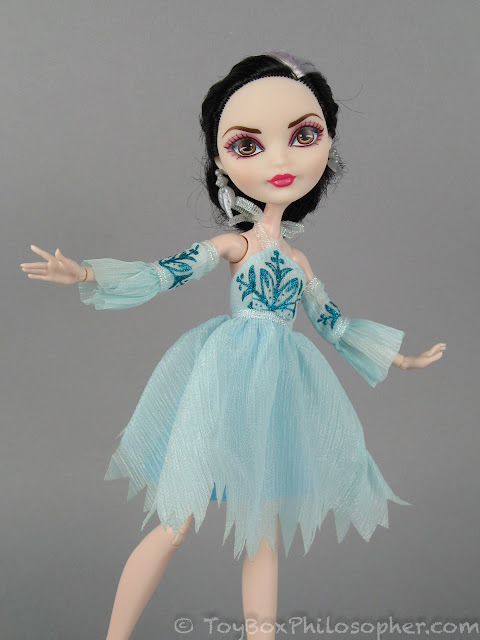 This is almost a dream come true--except that the joints take a while to loosen up to their full potential, and there are also a few design flaws that unnecessarily limit movement (or scrape away bits of the doll). Overall, I prefer the Jakks Periwinkle's articulation. Wings! I love the Disney Store Periwinkle's wings. 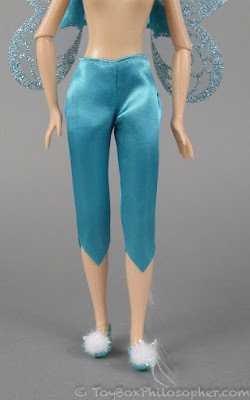 For anyone who wants to recreate the Disney Fairies stories, these permanent wings seem like a necessity. 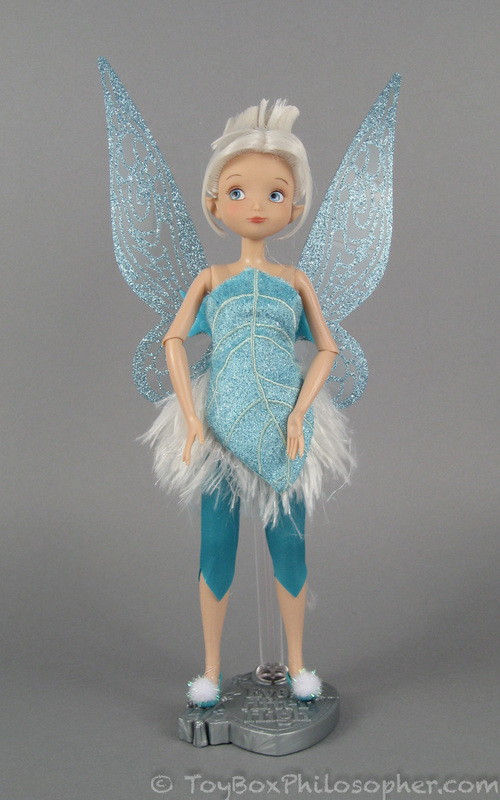 On the other hand, the Jakks Periwinkle is a more versatile doll with her removable wings. 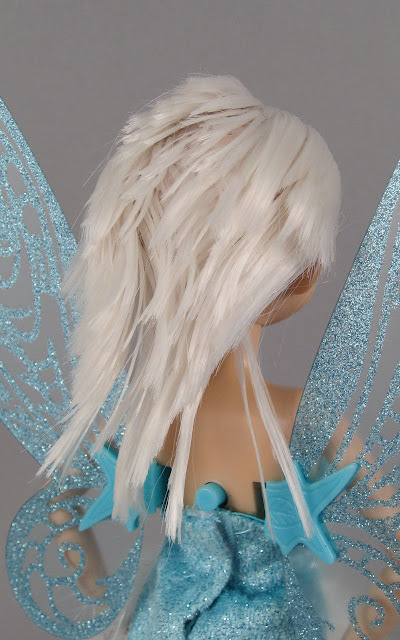 She can share clothing with other dolls and could re-enact scenes from the movies where the wings are folded up or concealed. 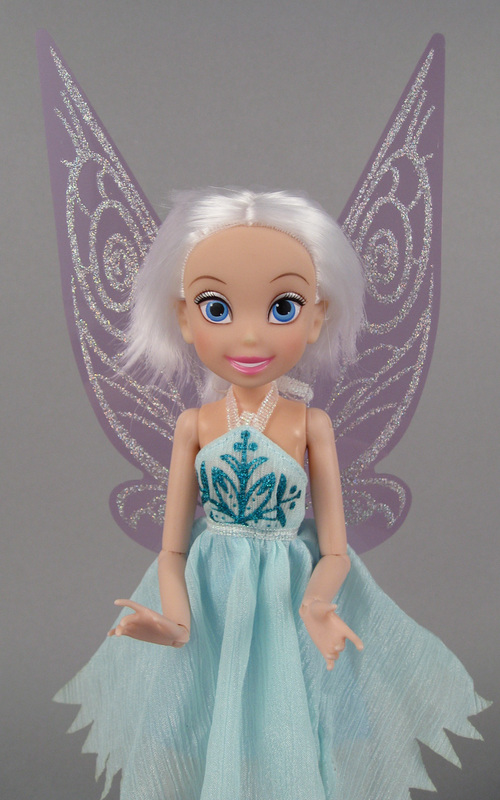 Still, there are plenty of wingless dolls out there...and plenty of dolls with detachable wings. 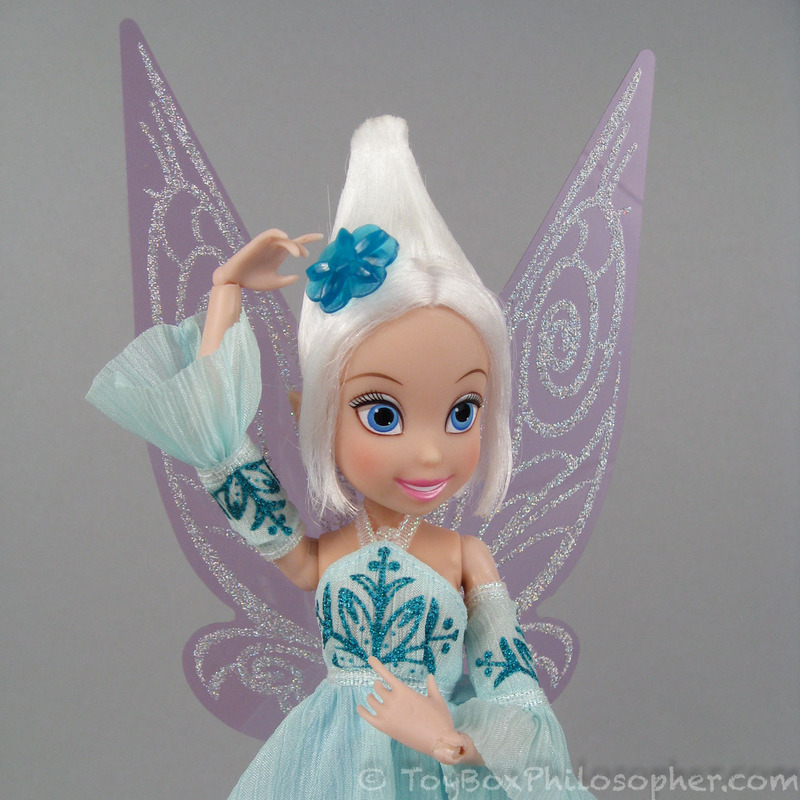 I like the novelty of having a permanently-winged fairy doll. For me, this is a huge part of the attraction of this particular line of characters. 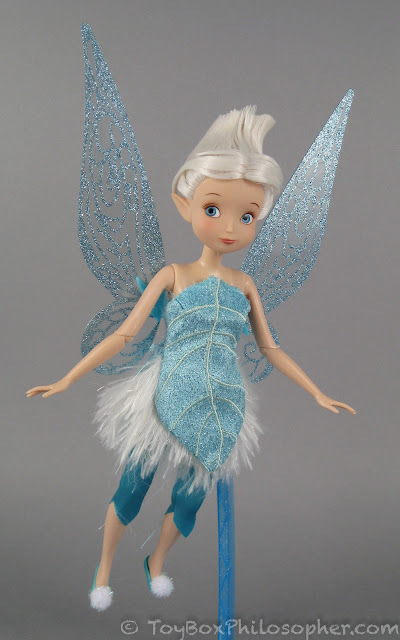 Despite my fondness for the Jakks doll's outfit and articulation, overall I favor the Disney Store's interpretation of Periwinkle the Frost Fairy. Melissa and I might have diverged in our opinions once or twice, but my bottom line ends up being very similar to hers: it's all about the face--and, for me, the wings. I love the Disney Store faces and wings. 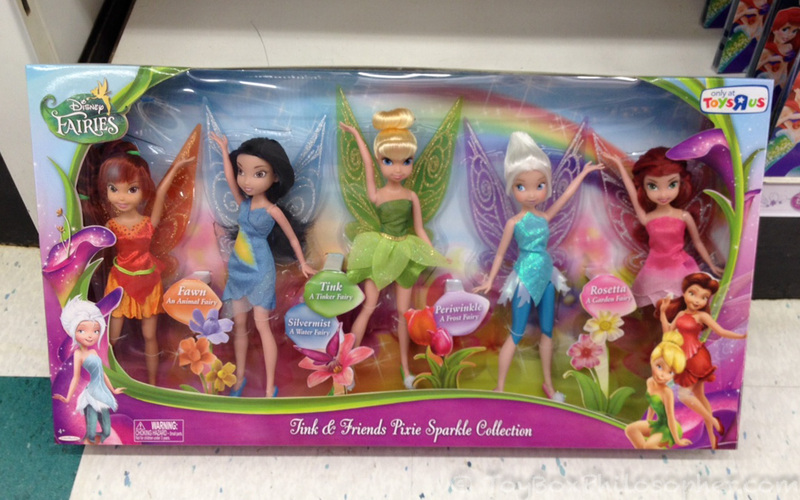 These dolls can't help but conjure the charming characters in the excellent Disney Fairies movies. 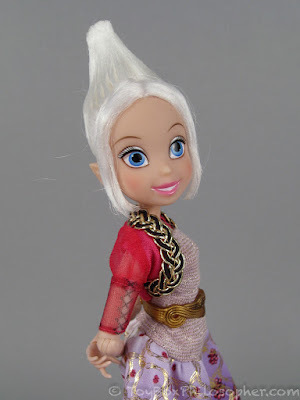 If I were a kid again, having just seen The Legend of the NeverBeast for the first time, pretty much nothing would have made me happier than a Disney Store Fawn doll and a plush Gruff...allowing the movie to live on in my imaginary games for months or even years after the closing credits. 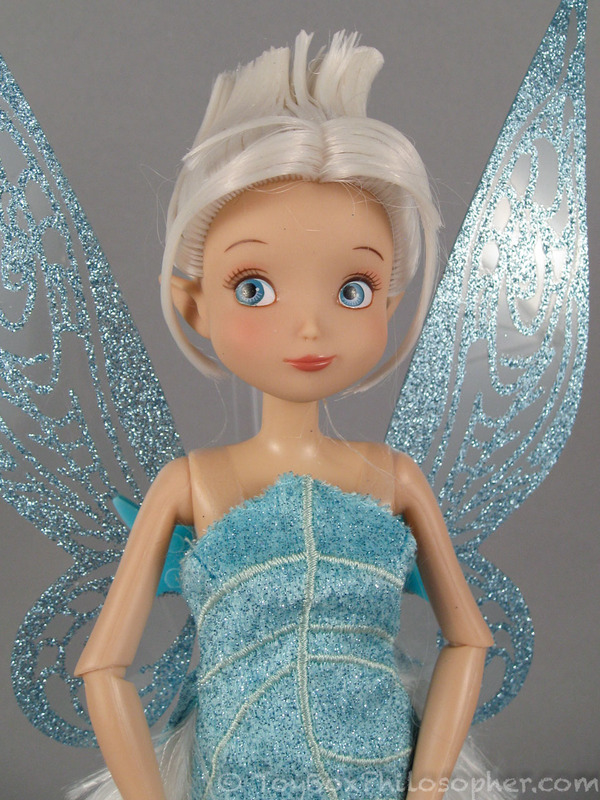 That's the magic of a good doll paired with a great story. Hello from Spain: fabulous review. Great pics. 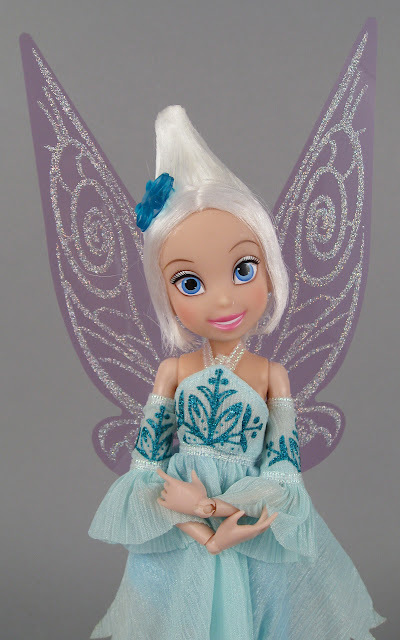 Disney fairies dolls are pretty. Keep in touch. Great review. Their hands don't come off. I emailed the company to ask because I also had trouble getting Periwinkle's sleeves back on. 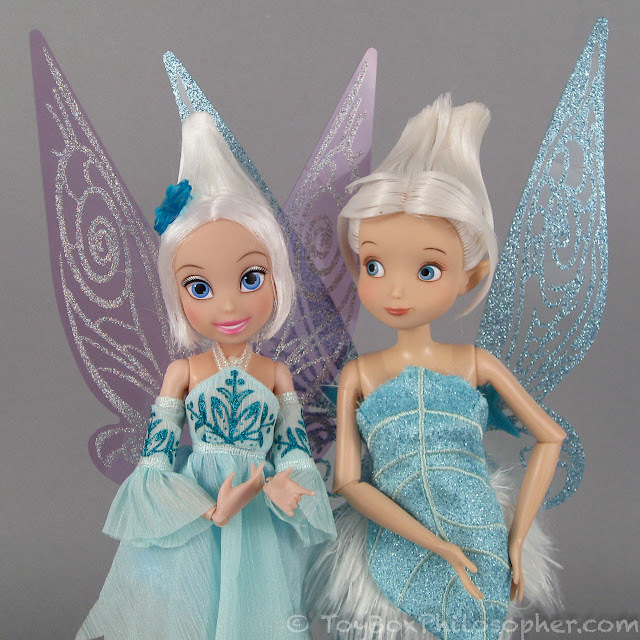 Periwinkle and Tinkerbell are my faves. You know you can just make a cone over them with sticky tape, pulling the fingers together at the same time. Works for Barbie! 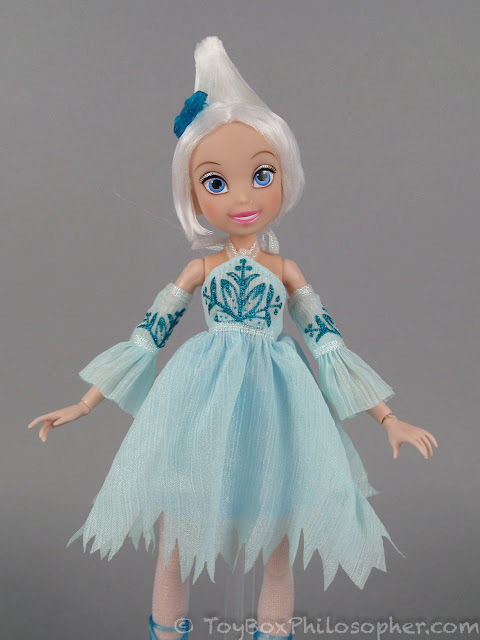 Interesting review; I've seen these dolls around, but hadn't realized how many differences there were between the lines - good to know! I'm so happy to see this review! I was literally just thinking two days ago that I hoped you'd review the Disney Fairies soon. I just saw Neverbeast a last week with my kids. It's a tearjerker for sure! I was eyeing the Jakks dolls at Target but after reading this I much prefer the Disney faces and wings. Thanks for another great review!! So I have had the pleasure of reading your blog for over a year now and have enjoyed it thoroughly ! 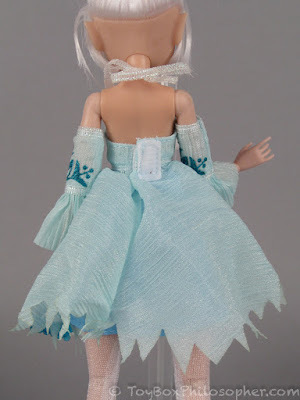 in fact it is my go to place to learn about new dolls and you have introduced me to a few lines I was on the fence about in the past. So since you have given so many wonderful tips I thought I would share one of my own. Nail clippers. 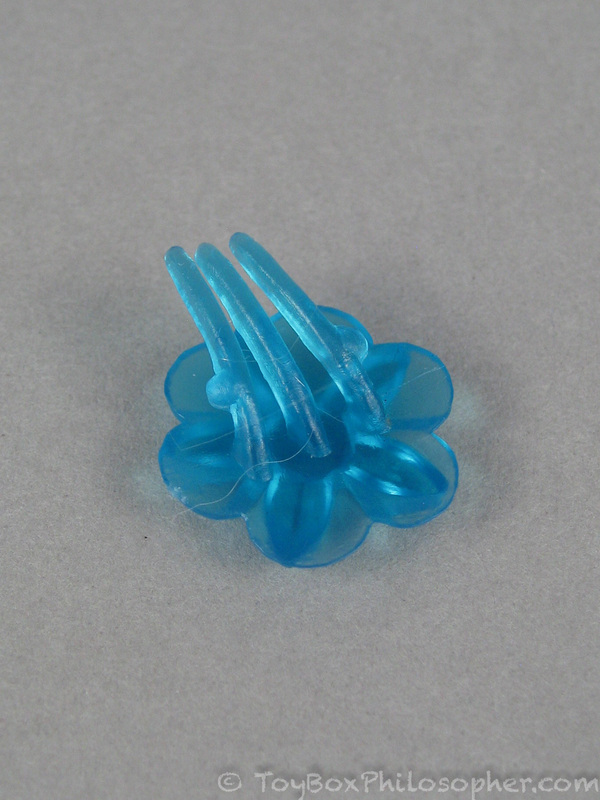 They work great for cutting the small plastic ties and removing tiny elastics. 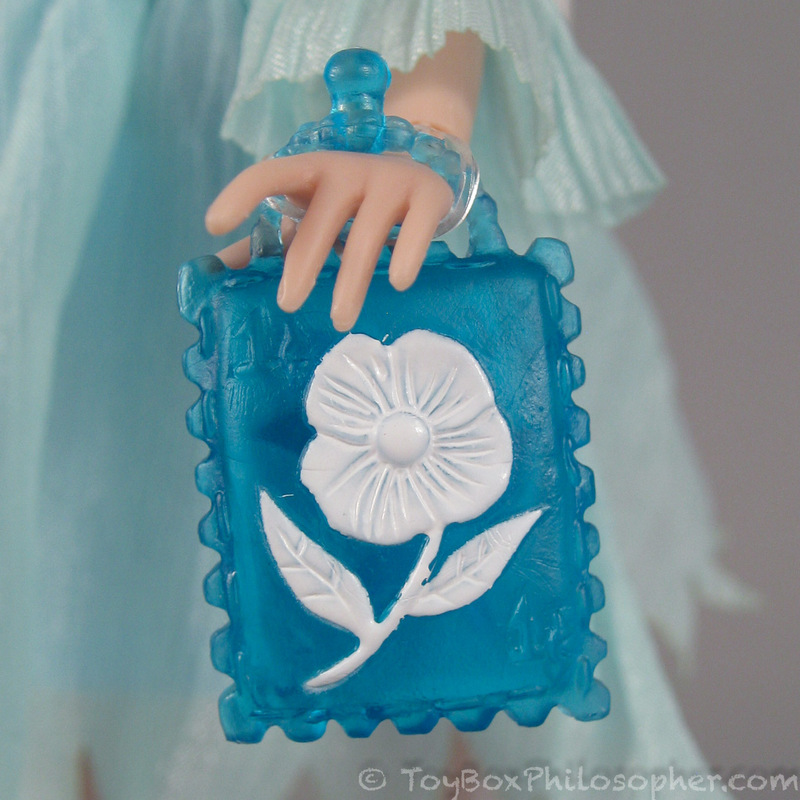 I collect mostly pullips, dals and byuls and always use these when freeing them from their cardboard prisons. 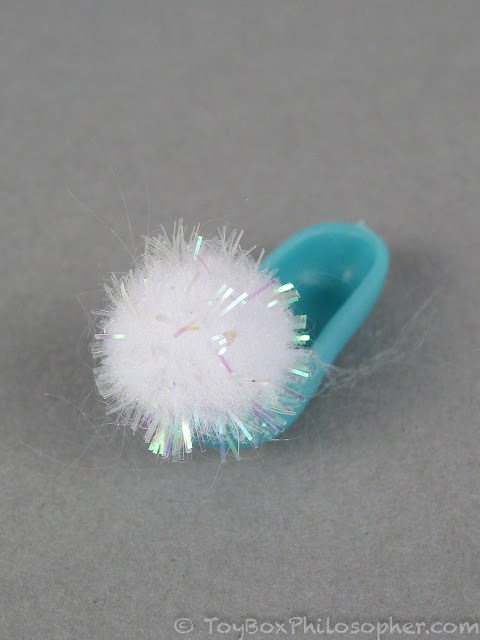 I find scicors to be a little unpredictable (even the tiny ones) and resorted to the nail clippers one day when I couldn't locate a pair to use... I have never looked back. Thanks for your incredible blog and keep it up. Another great review! Thanks, Emily! I have to say, Disney Store Periwinkle is adorable. What an interesting set of reviews! 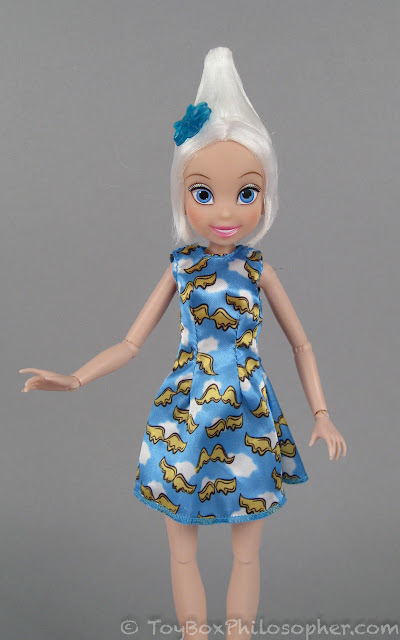 On an off-topic note, have you seen the new Our Generation mini dolls yet? They had a whole end cap dedicated to them at my target yesterday and I was very close to getting two... in fact, I think I need to go back and snag them! I know you reviewed the old version, but they now have playsets and extra outfits and even a whole dollhouse for sale. 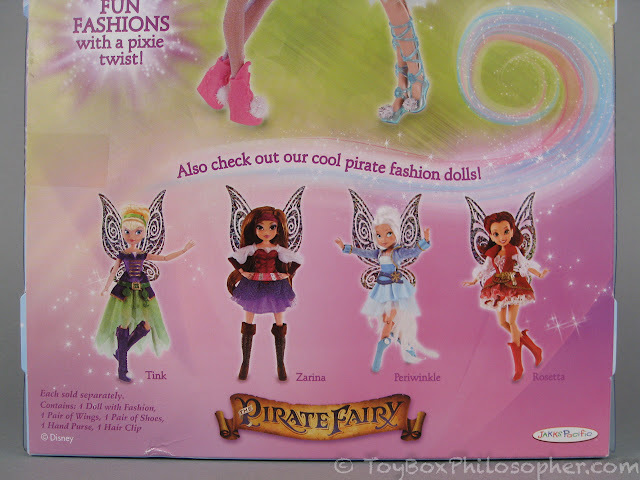 And the dolls have a more diverse lineup, I saw two darker skinned girls and one that appeared to be Asian or half asian. 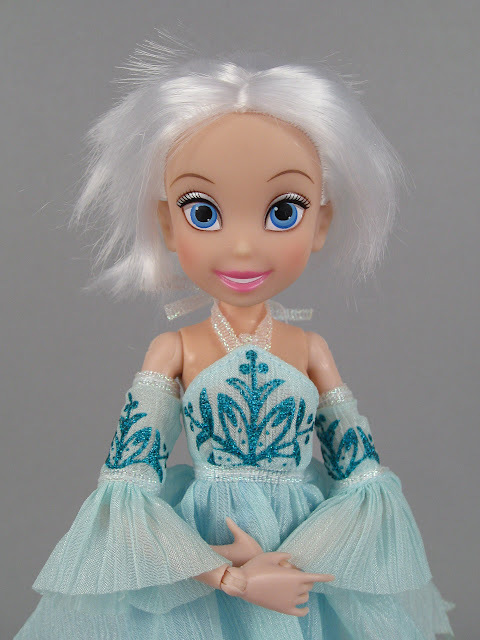 Personally, I am completely over those huge, mega-tilted, grey-alien eyes, both for dolls and in animation (sorry, Anna, Elsa, etc). 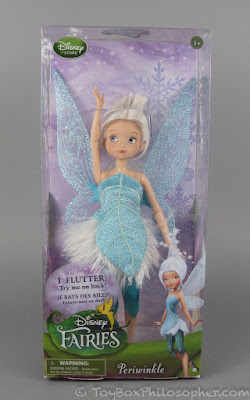 I'm glad to see the Disney store fairies going with something else (and that the animation also doesn't do the grey-alien eyes). 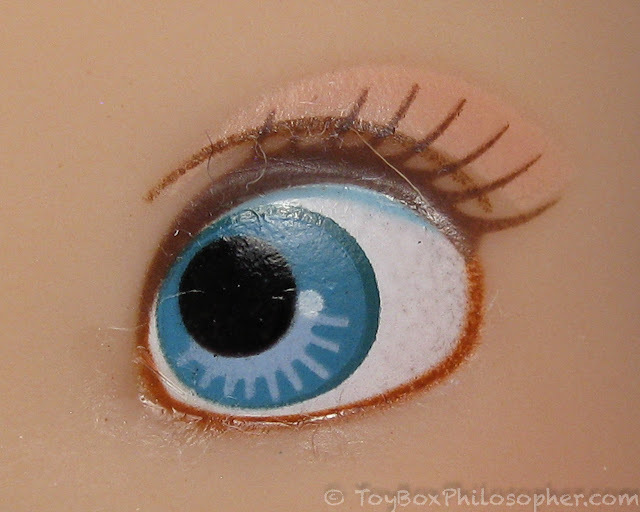 It's baffling to me that the Jakks doll has the huge eyes instead of being movie-accurate. It's like they went out of their way to be generic and boring. The nice thing about this doll, though is that she's really fun to take out in the winter for photos as her coloring looks so pretty against the snow! :) Good luck with school coming up...are you still teaching biology? We don't start until the 8th which seems so late (but I'm fine with that)!! Hi Emily! Great review as usual. I had been following your blog anonymously for almost a year now and I'd love to review for this blog. 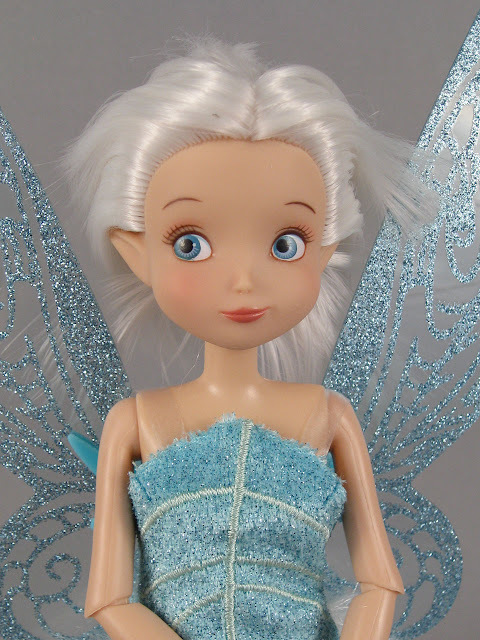 I am 15 and still new to doll collecting but loved dolls since birth! I have a basic Periwinkle doll and her face looks like the doll in the Toys R Us pack! 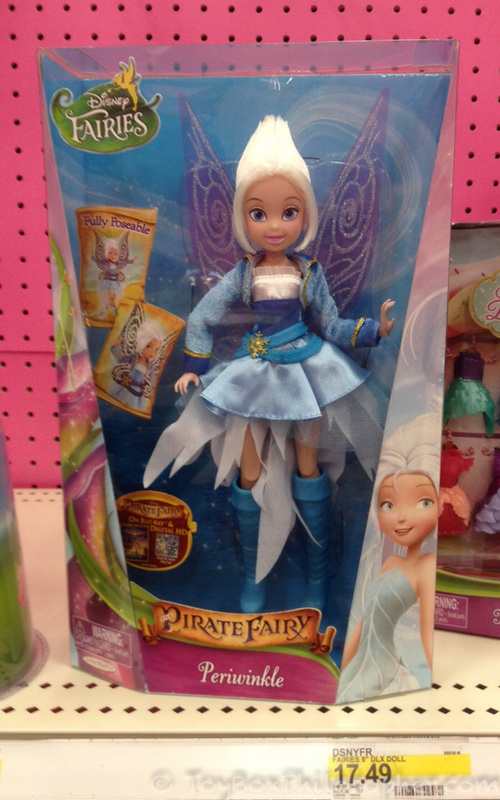 Is there any other other body for the Disney fairy to swap with?